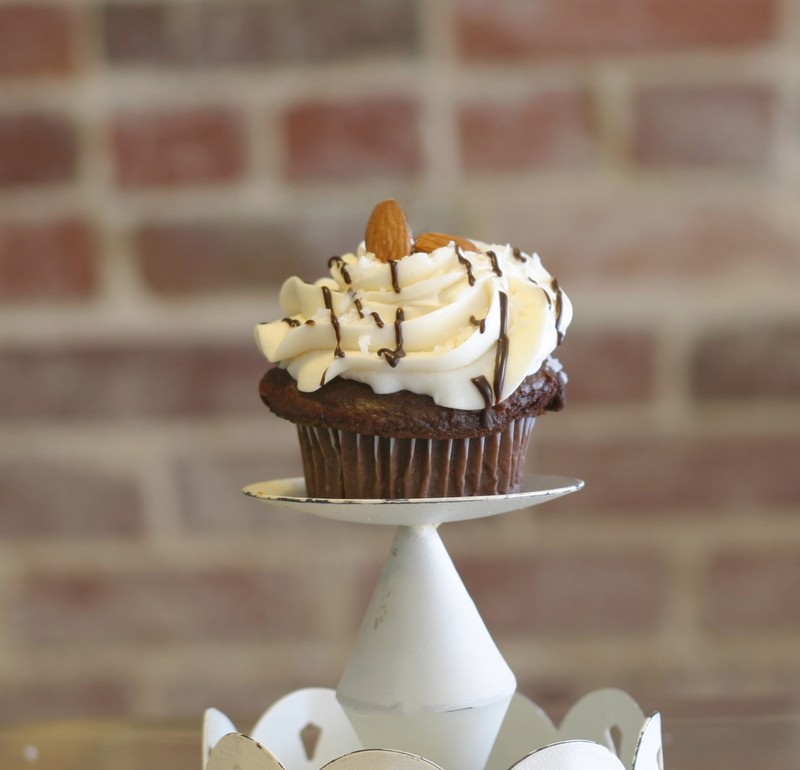 Delicious devil’s food cake, coconut buttercream, topped with almonds, coconut and a chocolate drizzle. 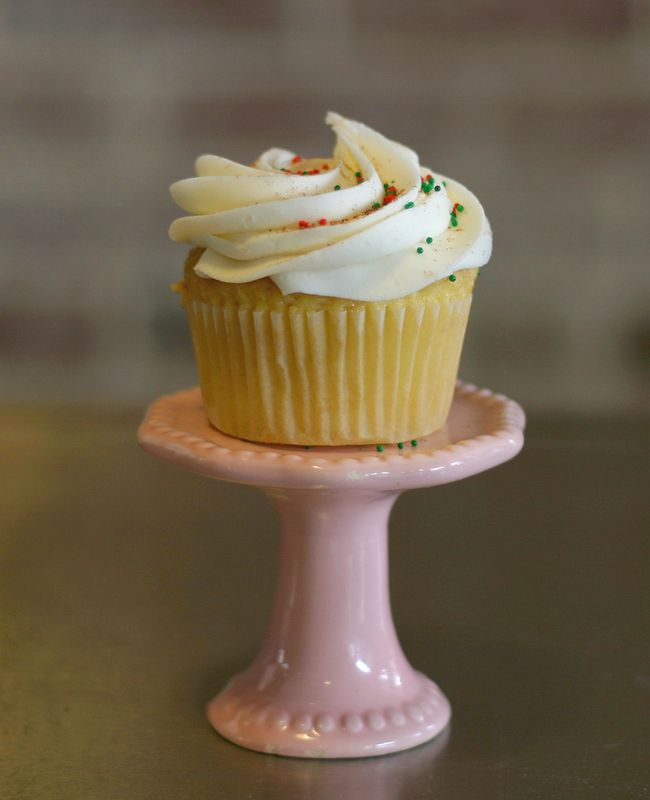 Our tender white cake with orange buttercream frosting, topped with some festive Auburn style. 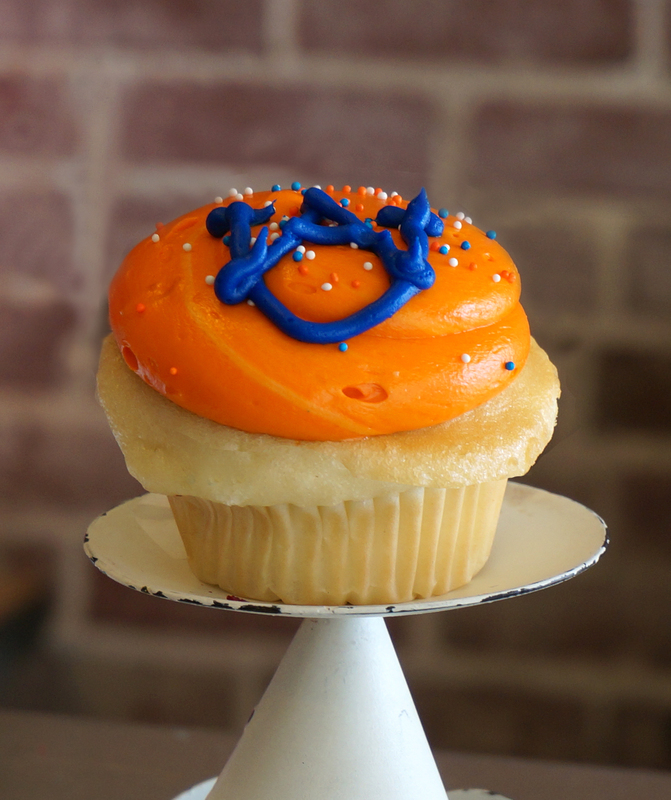 Perfect for an After-Toomer’s snack! 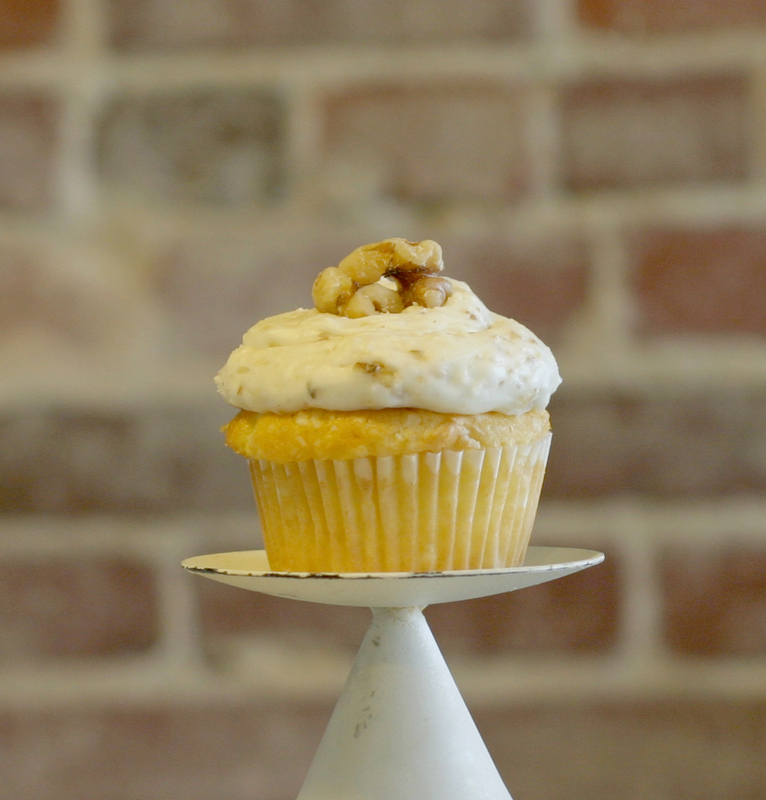 Delicious banana cake with cream cheese buttercream, topped with toasted pecans. 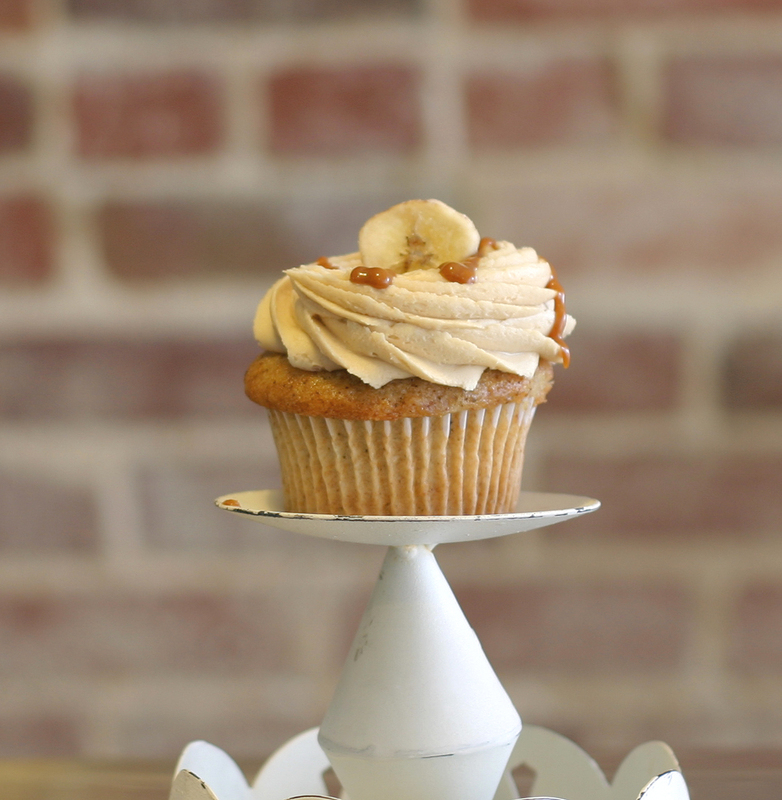 Super delicious banana cake topped with super good old fashioned caramel buttercream frosting and caramel sauce. A super superior dessert. 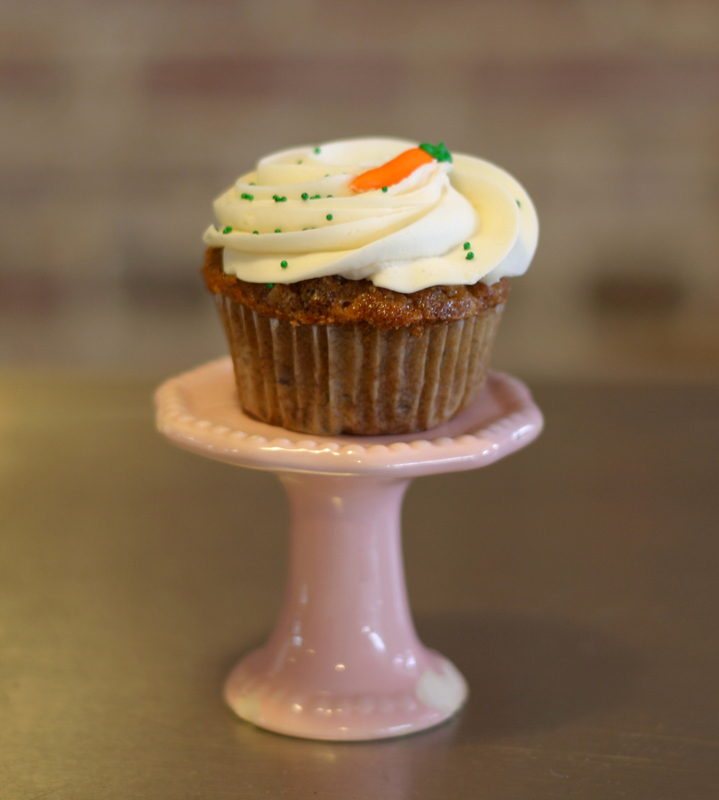 Our famous carrot cake, topped with cream cheese frosting. You’ll be spellbound. 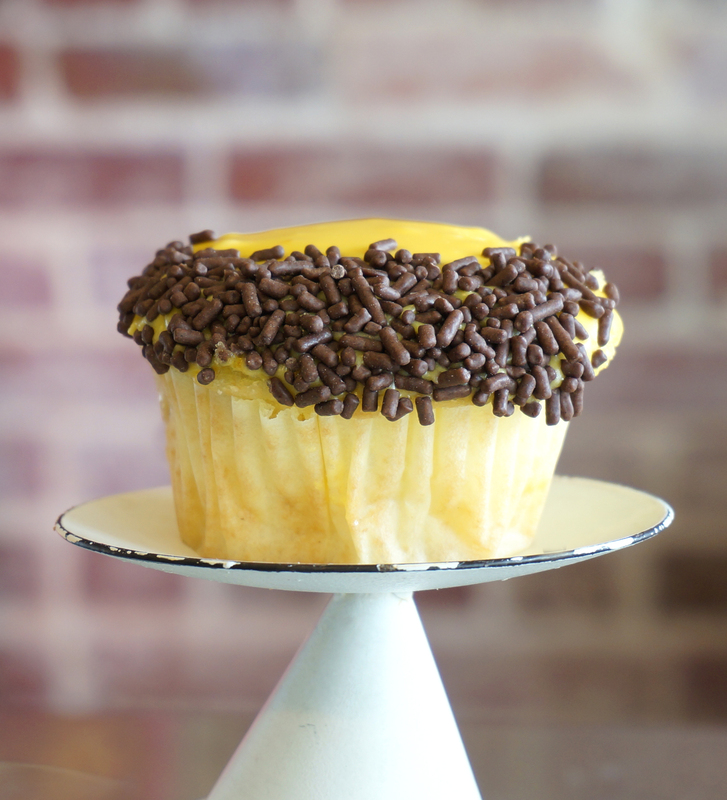 Just perfect yellow-butter cake with chocolate frosting, plus tons of sprinkles on top. You can act like it’s your birthday every week! 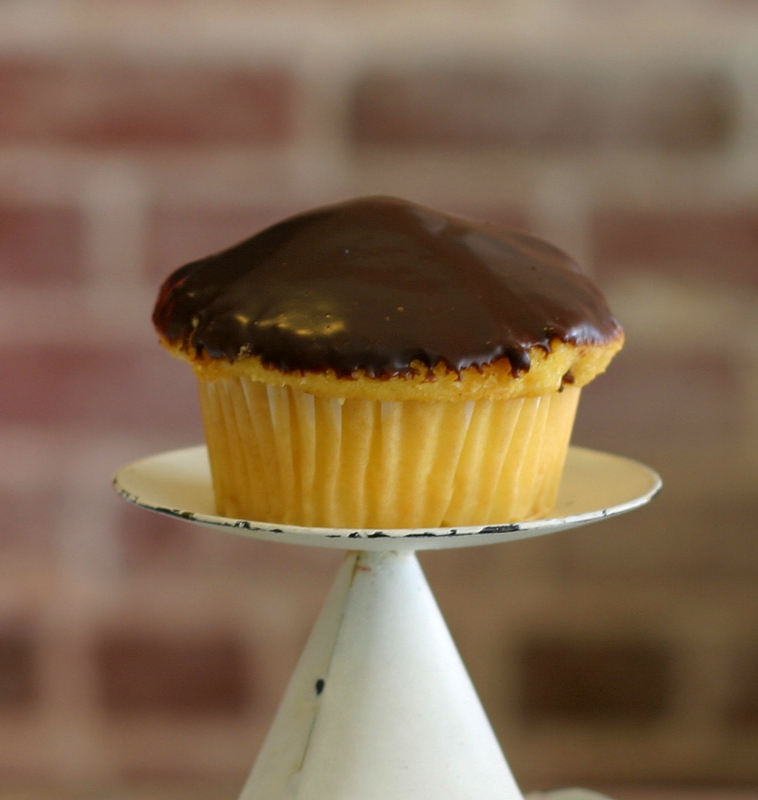 Butter cake filled with vanilla pastry cream and dunked in chocolate ganache. This one’s a favorite of the "Bahstan Palice Depahtmant". 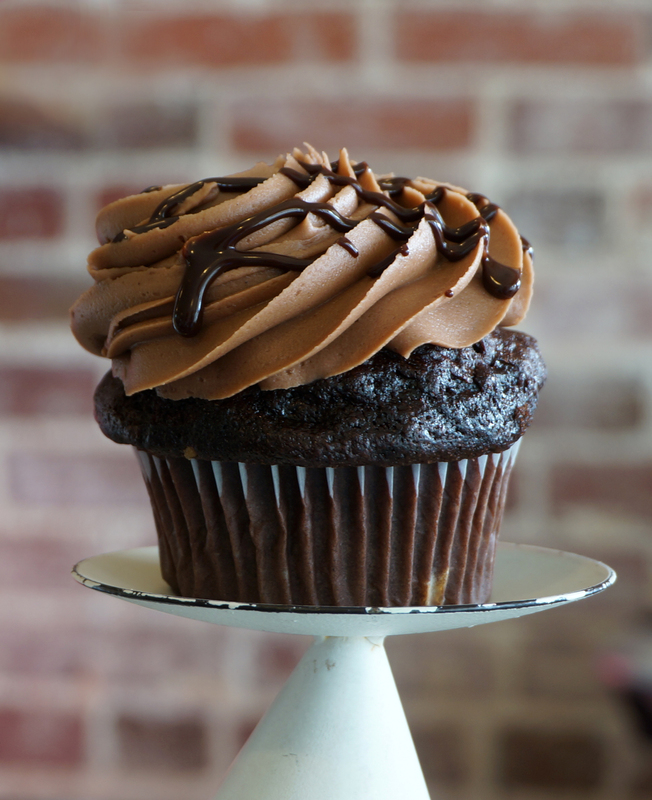 Decadent chocolate cake topped with a mocha buttercream, a drizzle of caramel and a sprinkle of sea salt. The sweet hits you, then the salt comes in with a right hook. You will not be left standing. 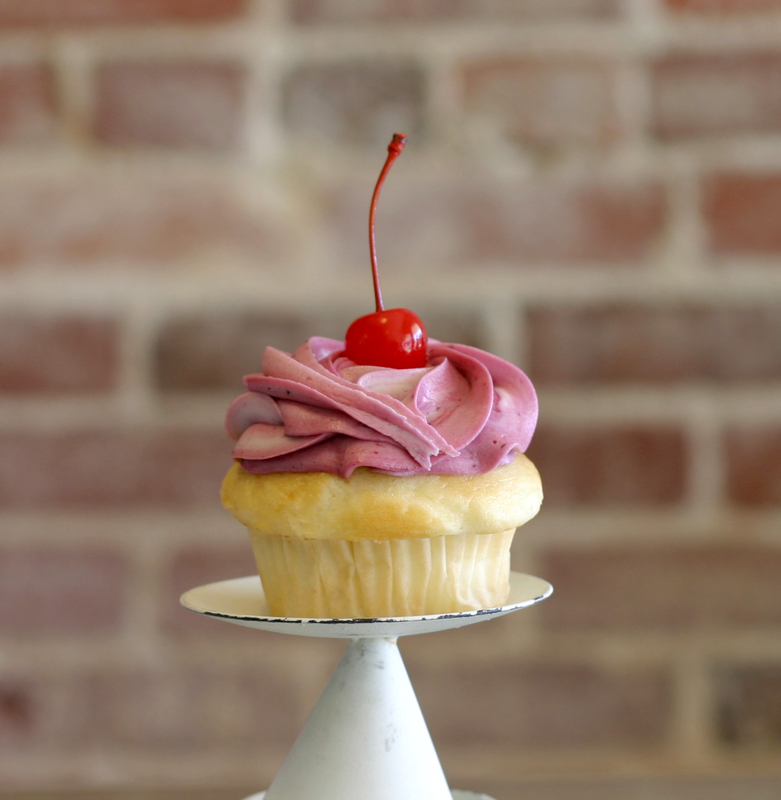 White velvet cake topped with a cherry buttercream and a cherry on top. Chocolate cake with a cream cheese frosting, topped with milk chocolate curls. Do not question this cupcake. Seriously, it has cream cheese in it. How could it not be good? 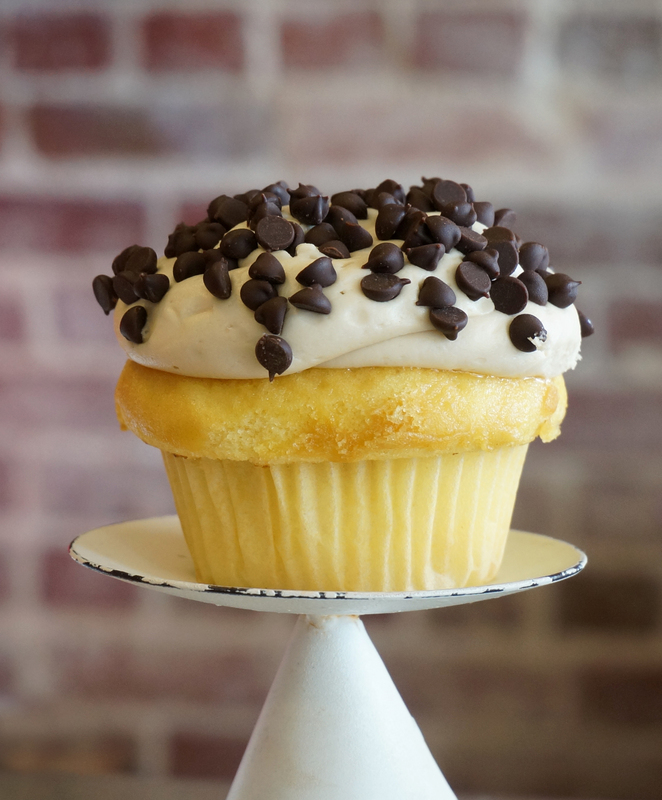 Butter cake topped with cookie dough icing and mini chocolate chips. 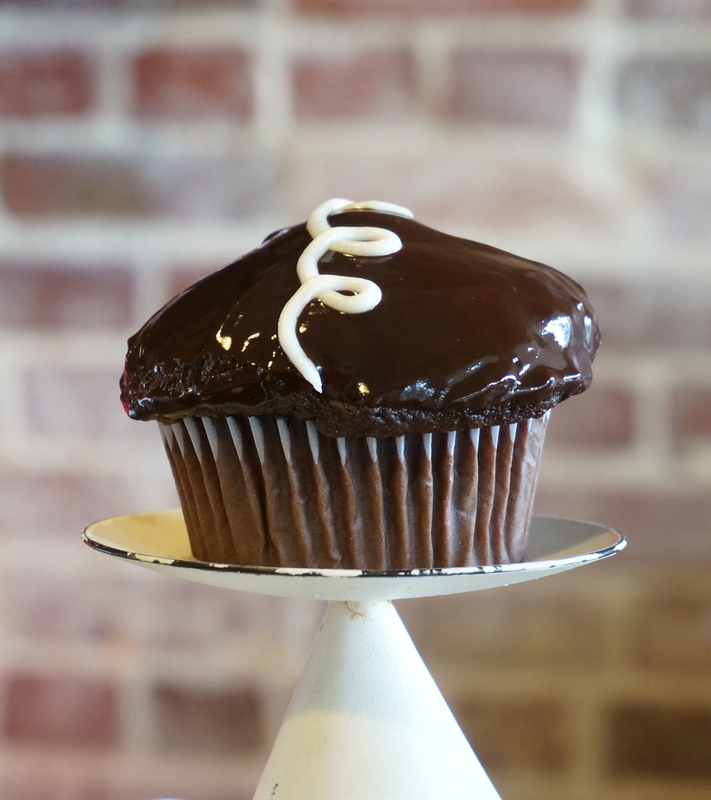 Decadent chocolate cake topped with our chocolate buttercream, rich ganache drizzle and a chocolate malt ball. It’s a high that doesn’t include a shady person in some alleyway. However, it may become addictive. Our delicious chocolate cake topped with incredible raspberry buttercream, chocolate ganache, chocolate sprinkles and a raspberry candy. 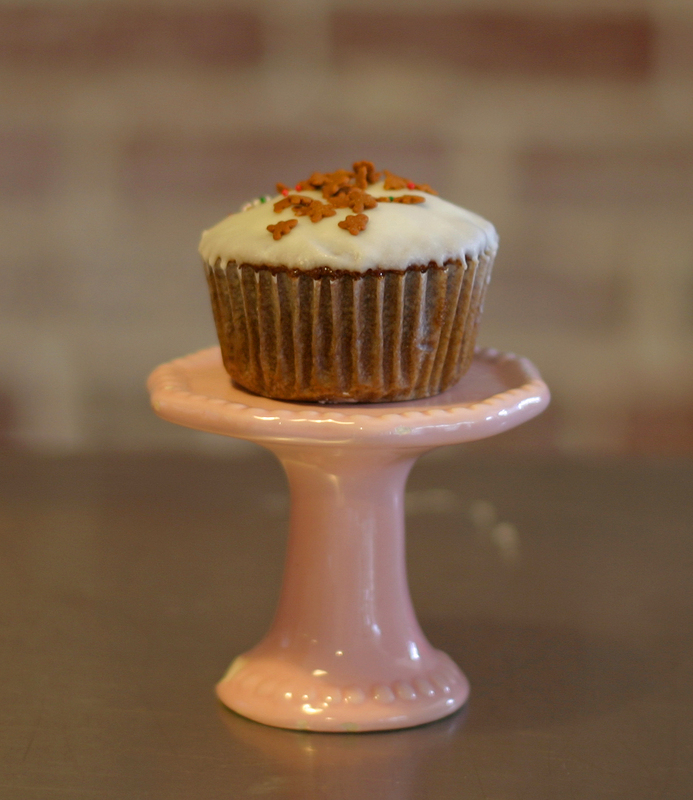 It’s like Valentines Day dreamt up a cupcake. 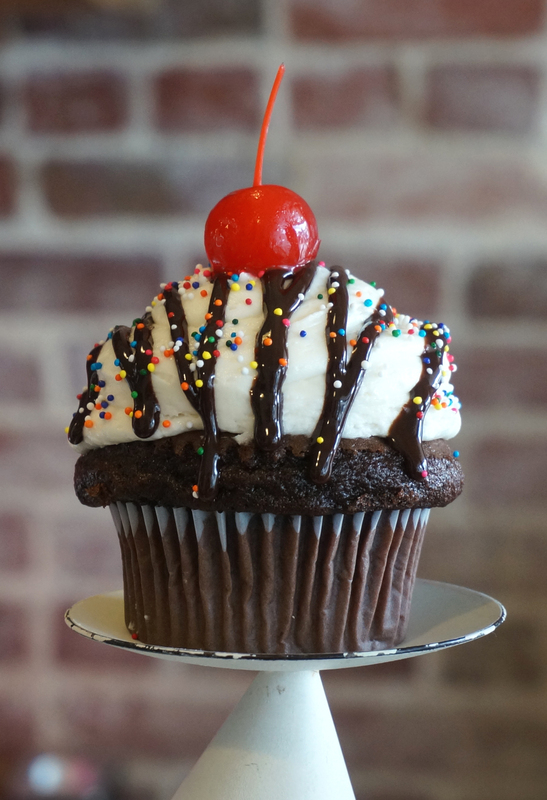 Chocolate cake, vanilla bean buttercream, chocolate ganache drizzle, sprinkles and a cherry on top. Pretty please! Chocolate cake dipped in ganache & dusted with a powdered sugar heart. A sweet for your sweetie! 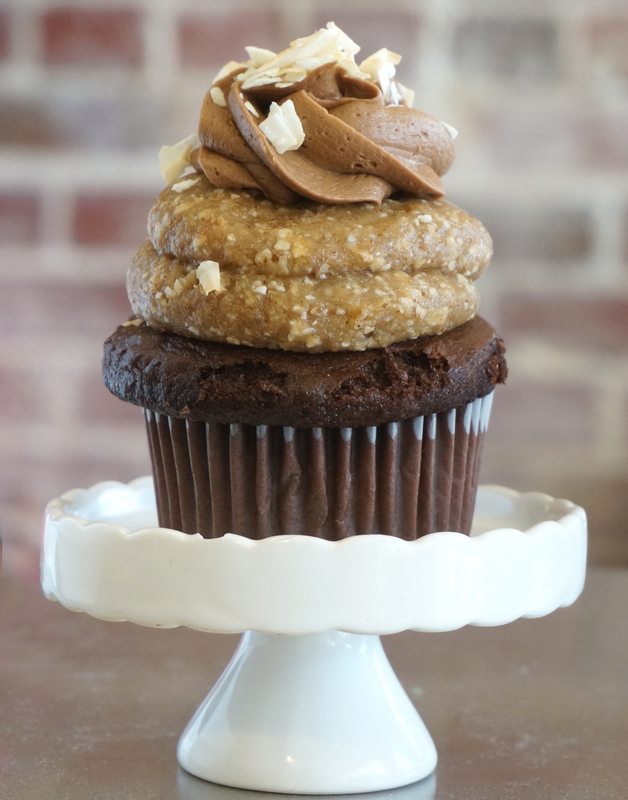 Peanut butter cake topped with poured fudge frosting. Do you have a husband? He will like this. Are you a husband? Your will like this. Are you a person? You will like this. 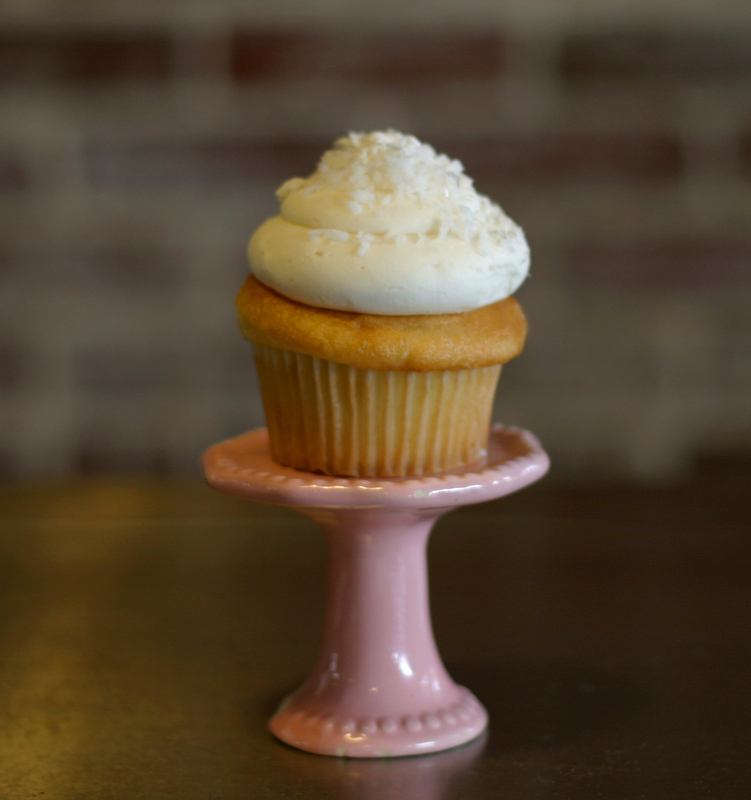 Tender white velvet cake, smooth coconut cream buttercream frosting, topped with a pinch of fluffy, sweet coconut. Coconuddy buddy. 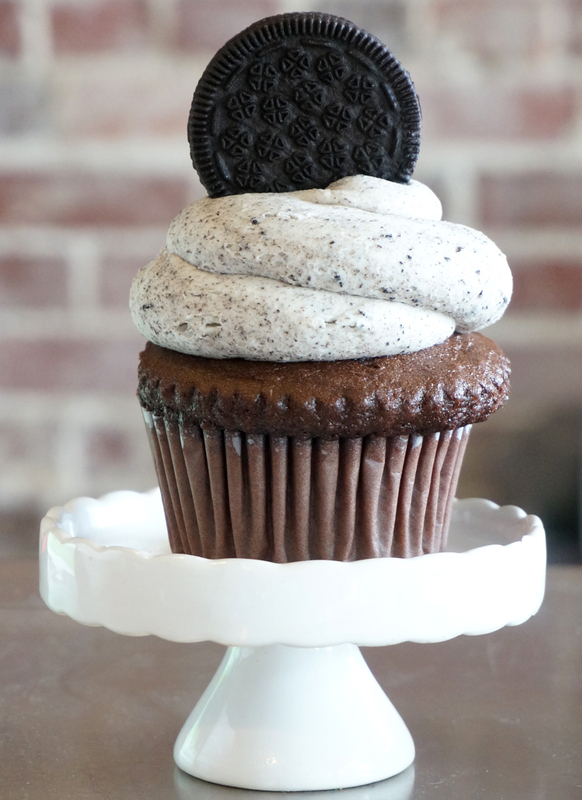 Chocolate cake topped with a cookies ‘n cream buttercream and a mini chocolate sandwich cookie. There is no wrong way to eat this. 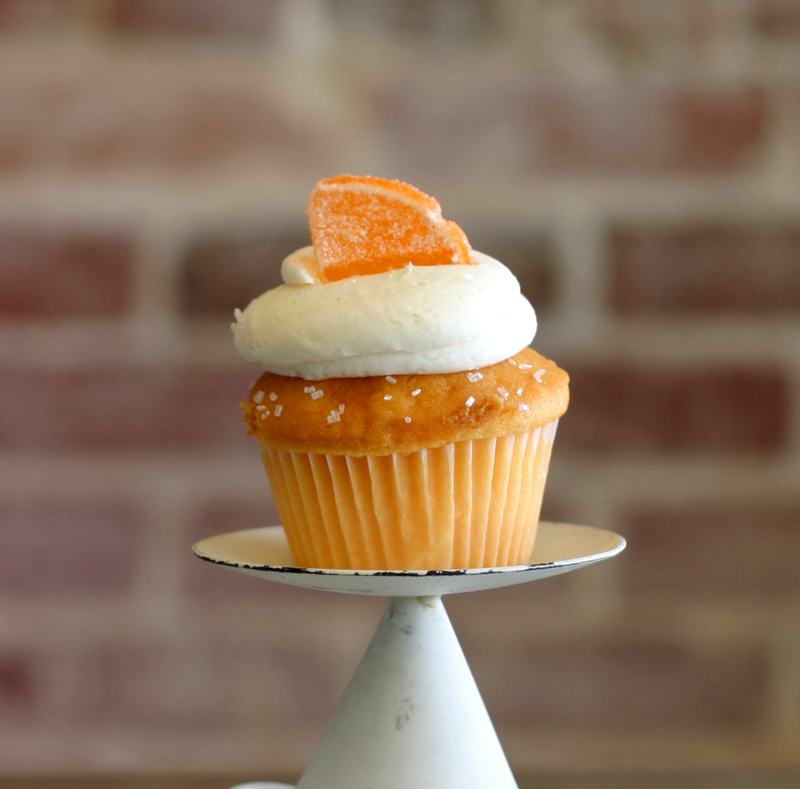 Delectable orange cake topped with our vanilla buttercream and an orange candy slice. Creamy, dreamy nostalgia. 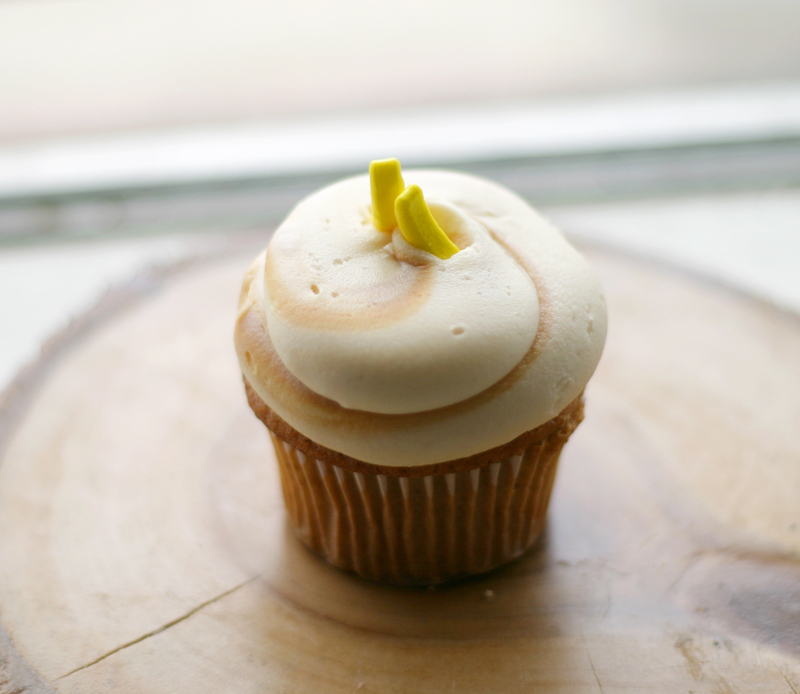 Fresh banana cake covered with a generous portion of our famous peanut butter buttercream frosting and candy bananas. Curious yet? You’ll flip over the taste! 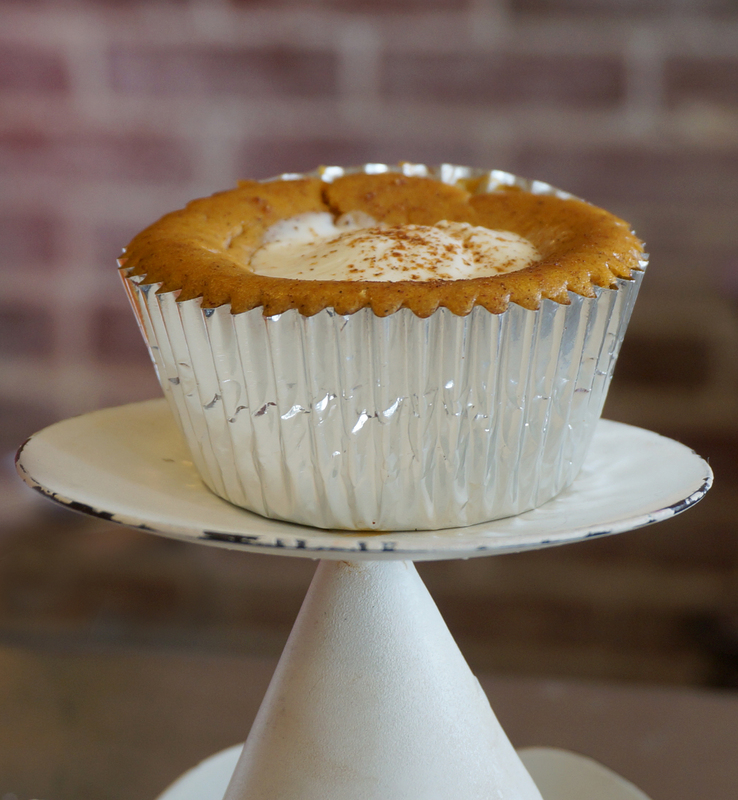 Our version of Italian Cream Cake- a coconut loaded butter cake topped with coconut-walnut cream cheese buttercream. It’s an offer you can’t refuse. Rich butter cake with eggnog frosting, dusted with nutmeg. Two kinds of cake, our yellow butter cake and chocolate cake, baked with Fairhope Brewing Company’s Judge Roy Bean Coffee Stout. 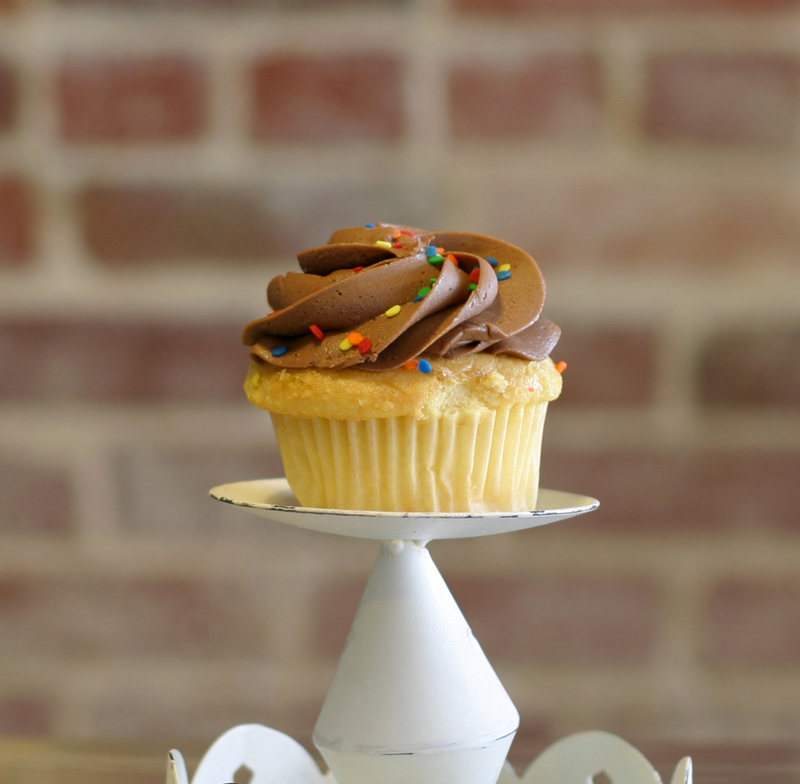 Topped with a coffee buttercream. Brewed and baked with love! 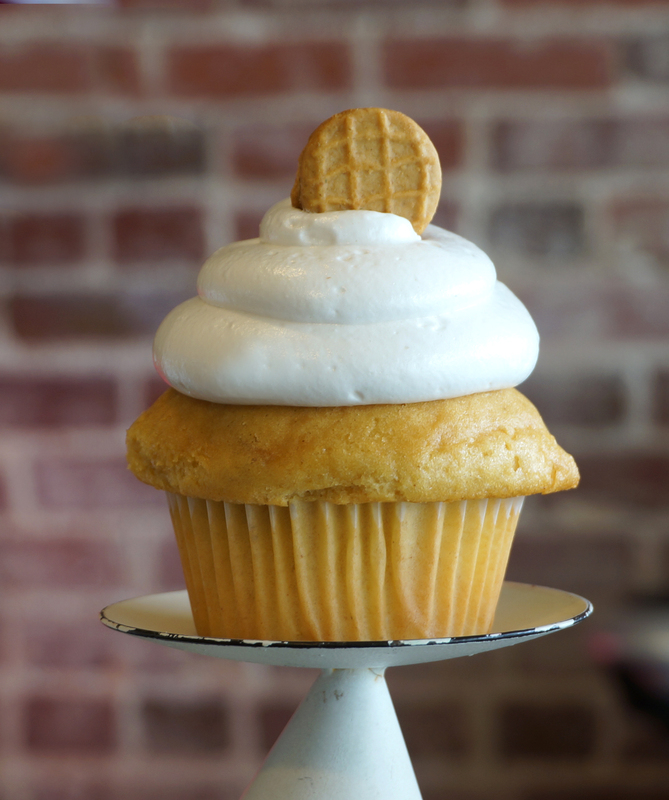 Peanut butter cake with marshmallow meringue and topped with a peanut butter cookie. Chocolate cake with milk chocolate cream cheese hazelnut buttercream. You’ll be so cultured. Chocolate cake with a German chocolate icing filled with coconut and pecans. Es ist sehr gut!! Gingerbread cake with a cream cheese glaze. 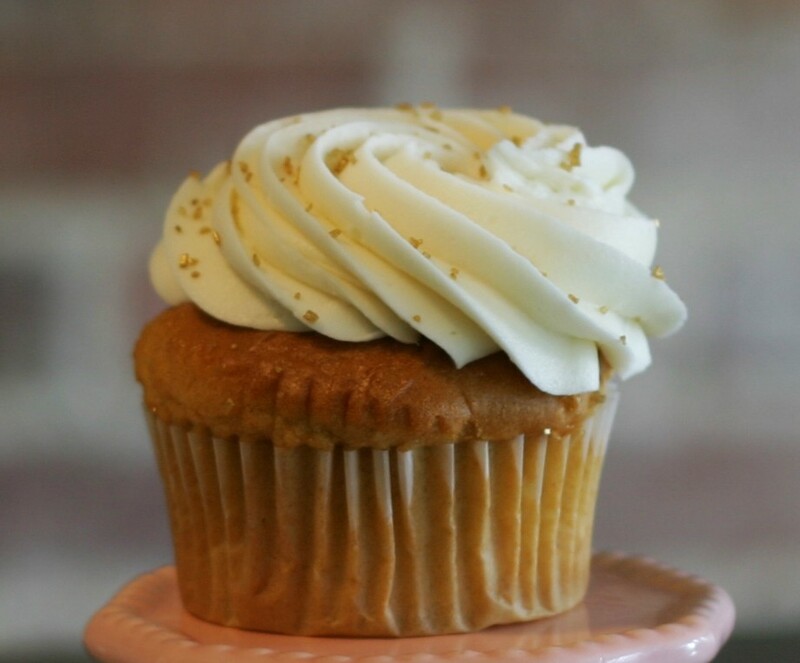 Light & sweet, the perfect holiday treat. Lemon white cake baked with Good People Brewing Company’s Bearded Lady American Wheat Ale, topped with a cream cheese orange glaze and beardy chocolate sprinkles. Handsomely beautiful. A chocolate cake with Good People’s Coffee Oatmeal Stout beer baked right in, and topped with a coffee cream cheese buttercream and chopped chocolate covered coffee beans. Eat Local, drink local! Grapico through and through. 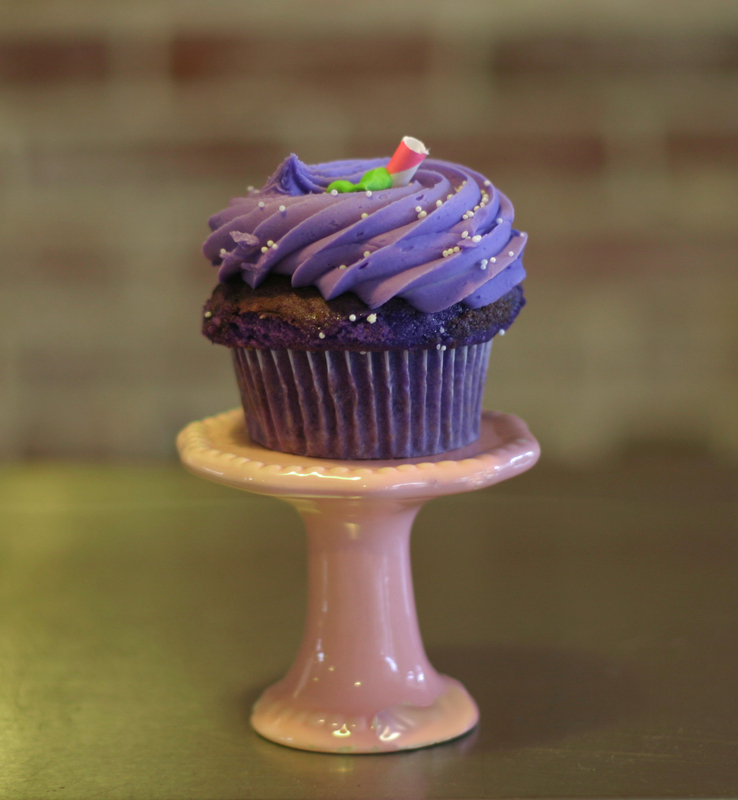 A grape cupcake with Grapico syrup filling topped with a purple grapico frosting! 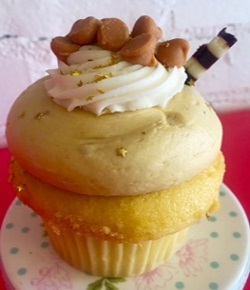 Yellow cake with delicious butterscotch icing topped with butterscotch chips. Harry, Hermione and Ron approved. Chocolate cake topped with peppermint buttercream dipped in chocolate ganache and topped with holly leaves. 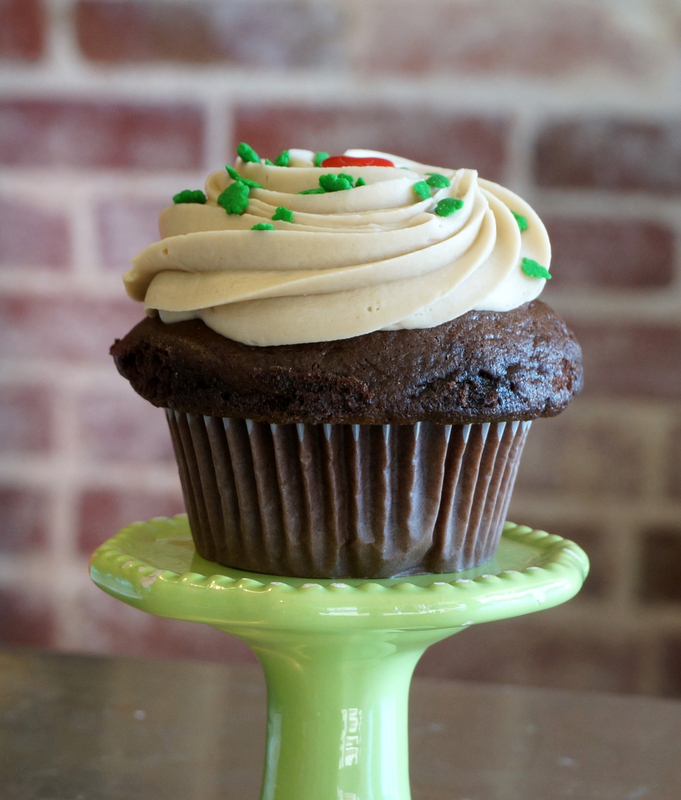 Have a holly jolly cupcake...it's the best one of the year! 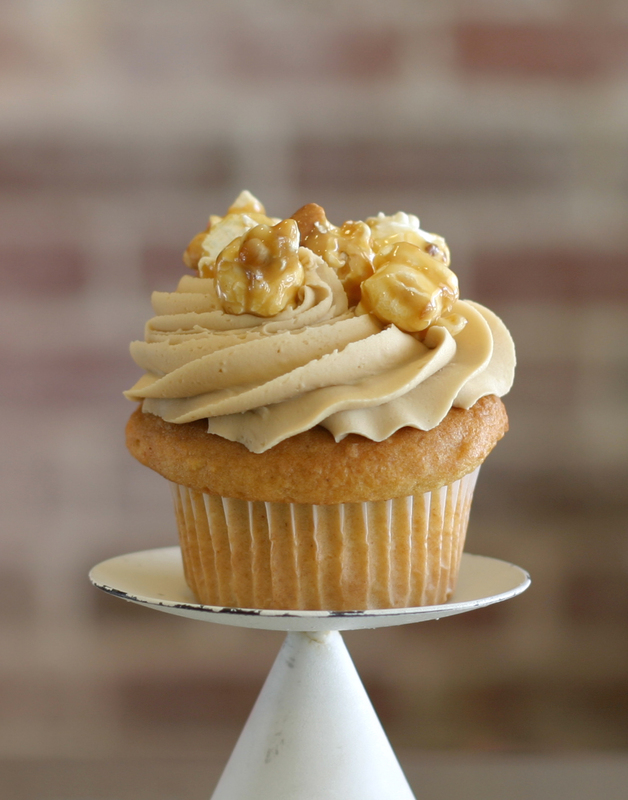 Peanut butter cake topped with caramel buttercream and caramel corn. 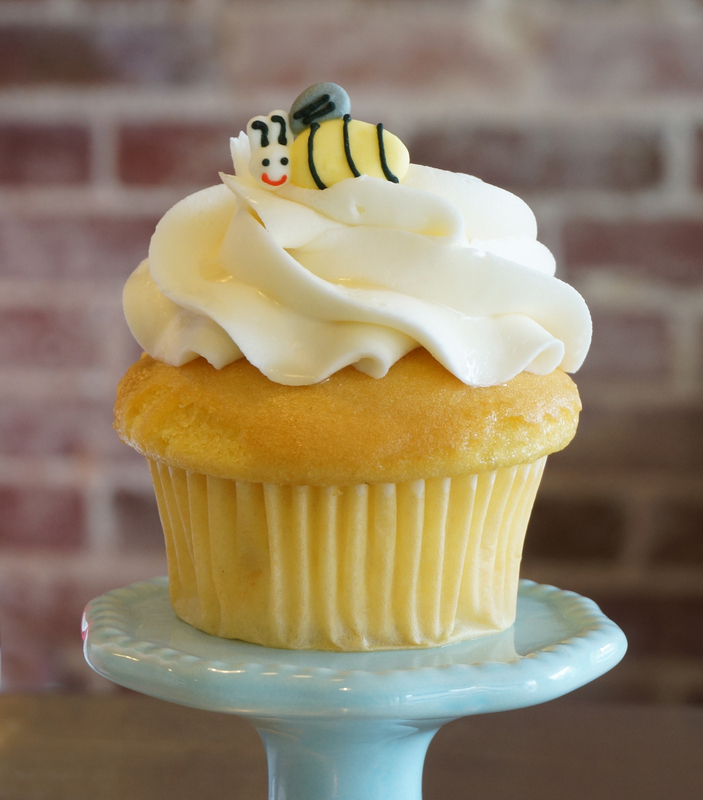 Yellow buttercake with delicious honey frosting, honey drizzle and a candy bee on top. What’s buzzin cousin? 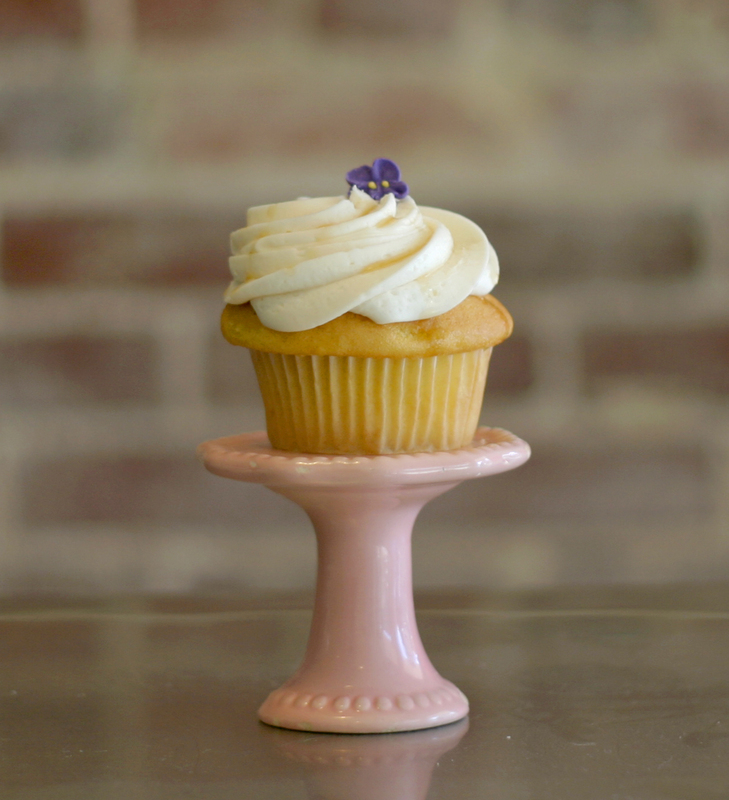 Our yellow cake topped with a cream cheese buttercream and drizzled with an unbelievable lavender infused honey. Topped with a candy violet flower. Thank you France and bees. 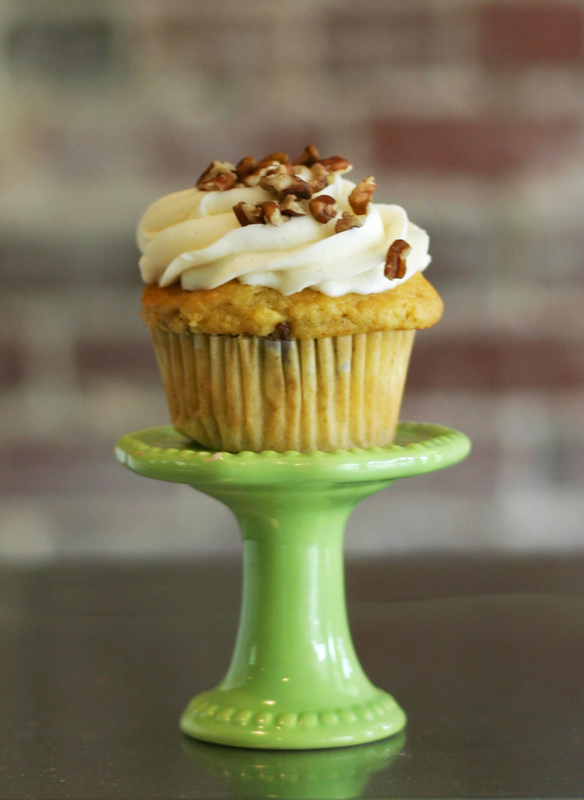 Our pineapple, banana, cinnamon, pecan studded cake topped with a cream cheese buttercream and more chopped pecans. This one ain’t just for the birds. Guinness beer chocolate cake topped with irish creme frosting. It’s the luck of the Irish! 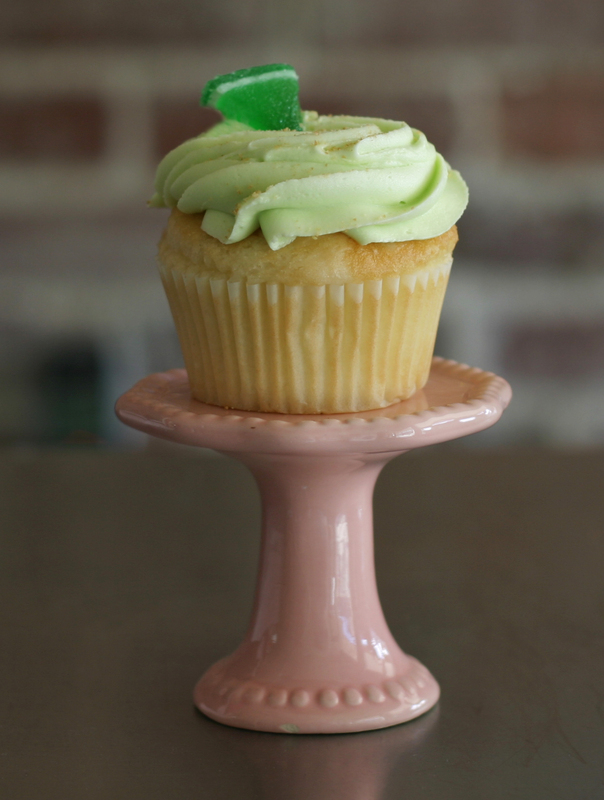 White velvet cake topped with key lime buttercream, a gummy lime candy and graham cracker crumbles. It’s tart, it’s sweet and it’s so good it will hurt your feelings. 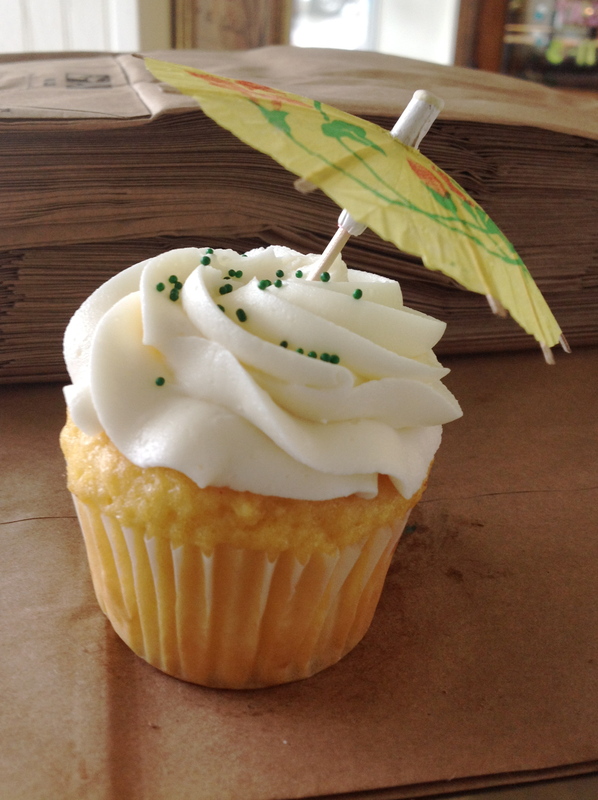 Lemon cake topped with a cream cheese buttercream. 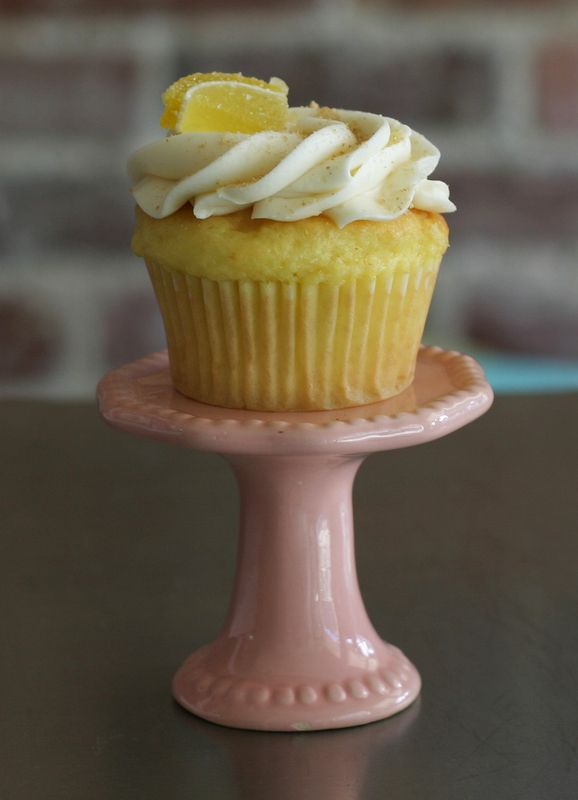 Easy peazy, lemon cheesy….cake! 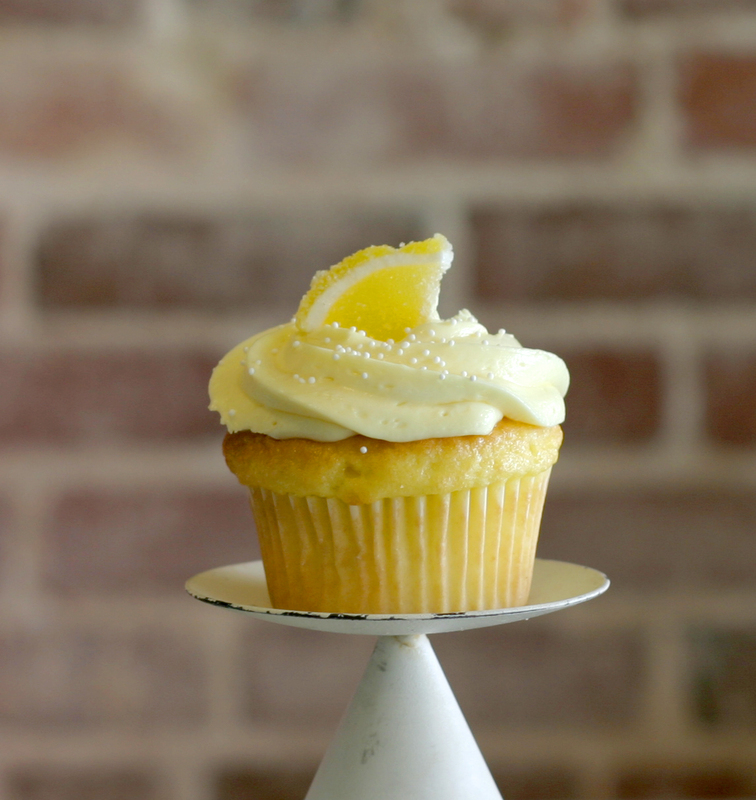 Our highly demanded lemon cake topped with a fresh, tart lemon buttercream and a lemon slice. Do you love lemon? 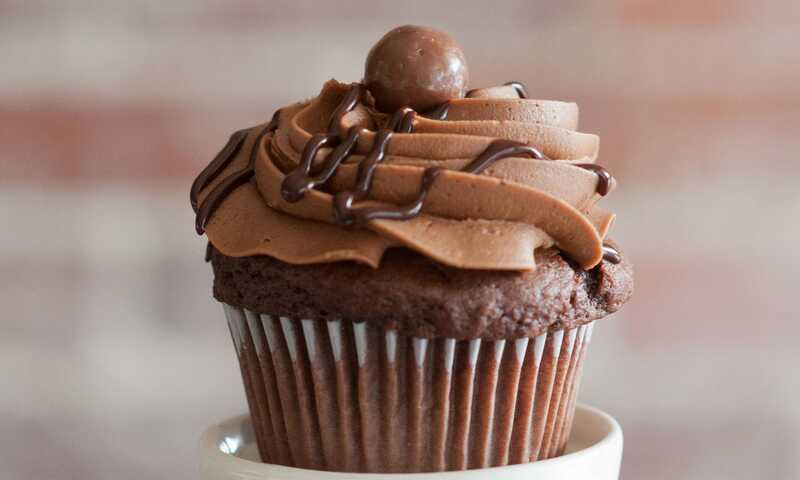 This cupcake will love you back. 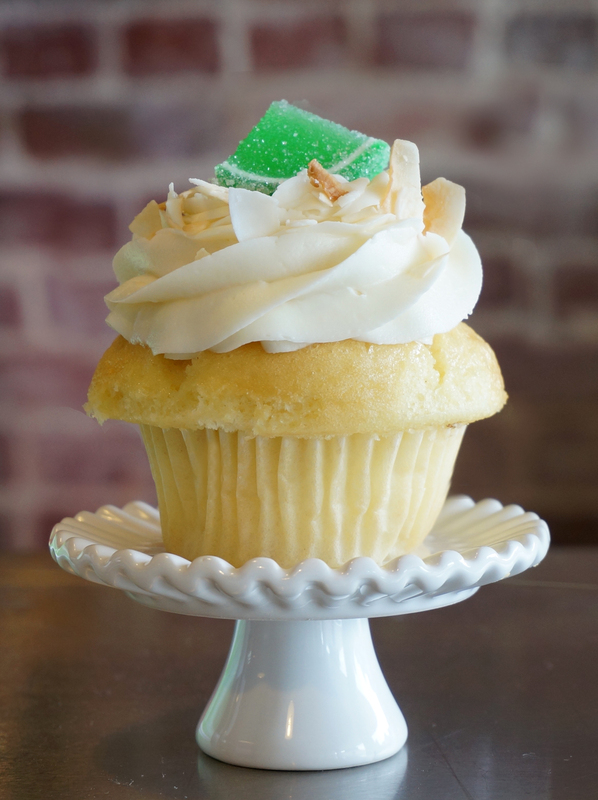 White cake, filled with a lime curd and topped with a coconut creme frosting and toasted coconut flakes. 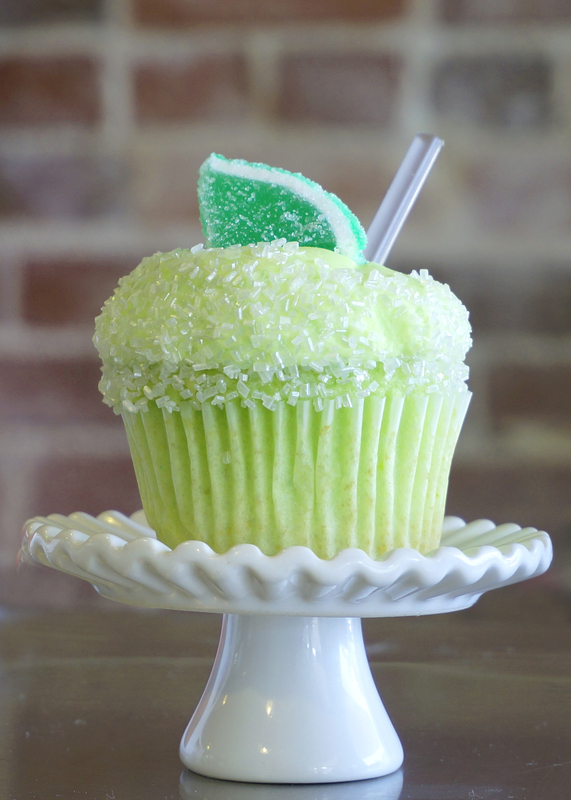 You put the lime in the coconut, mix it all together…. Chocolate cake with our amazing Over The Moon vanilla bean buttercream topped with silver stars. 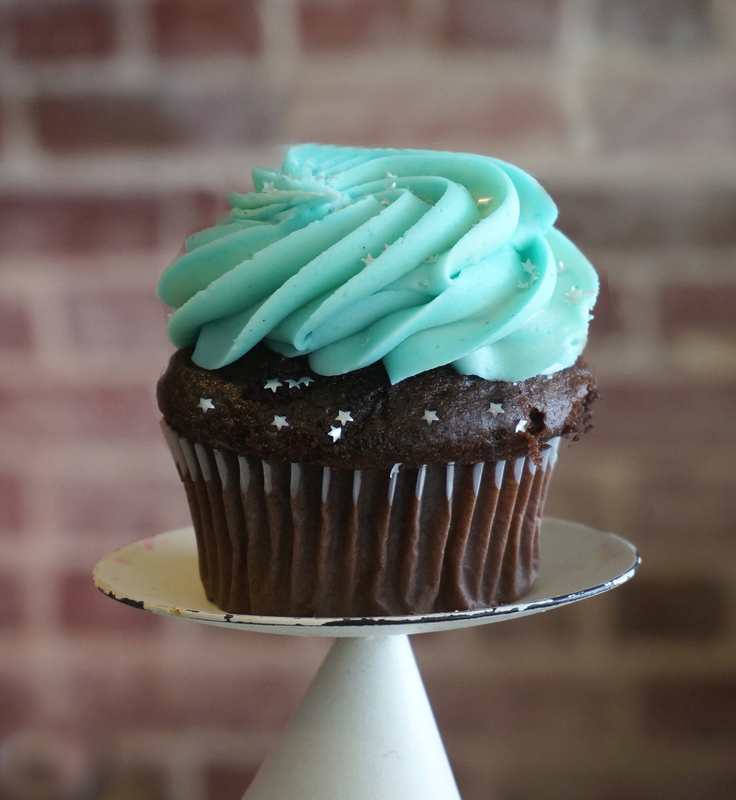 50% of sales of this cupcake go to benefit the Alabama Make a Wish Foundation! 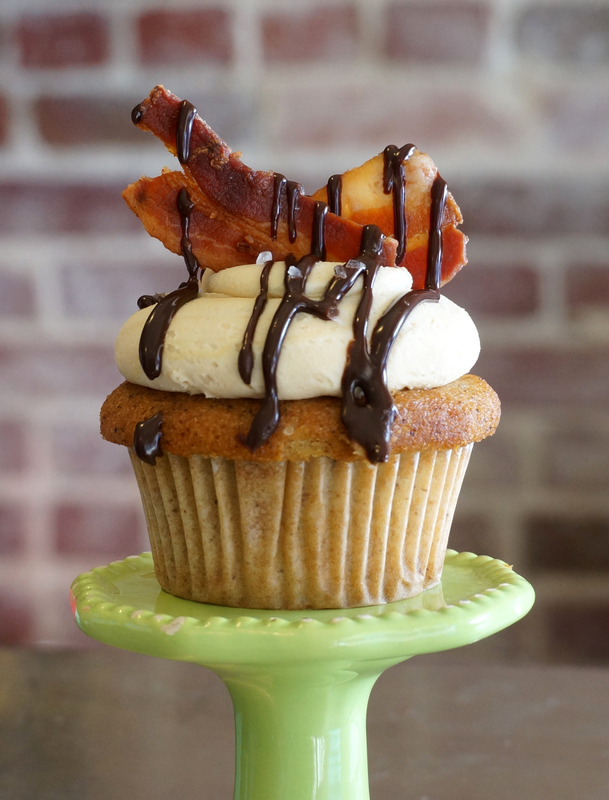 Tasty butter cake topped with a maple buttercream, studded and topped with pieces of crisp bacon….THERE IS BACON ON THIS. SUCCUMB TO ITS POWER…..BACON. 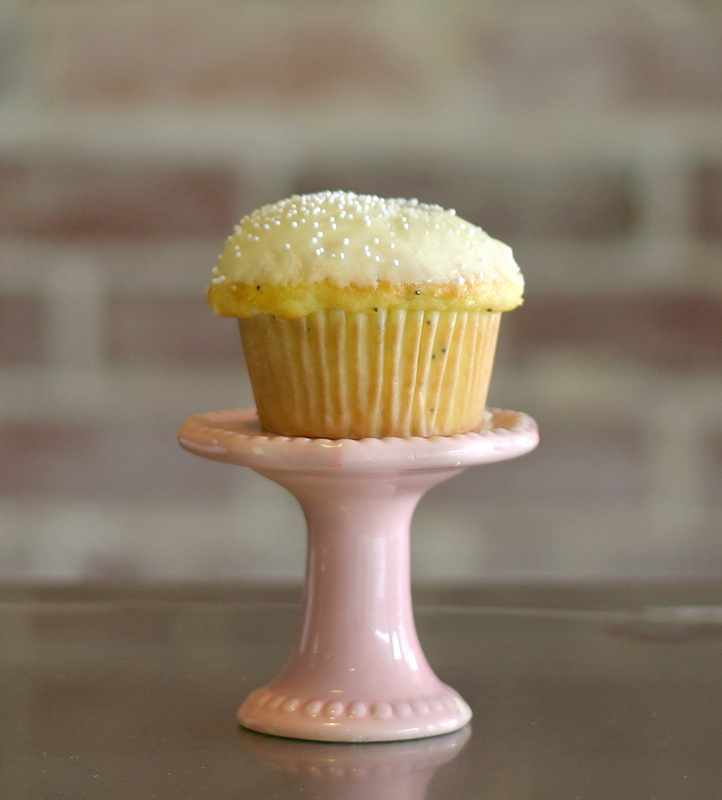 A key lime cake, topped with lime buttercream and rimmed with sugar sprinkles. ¡Qué hermoso! 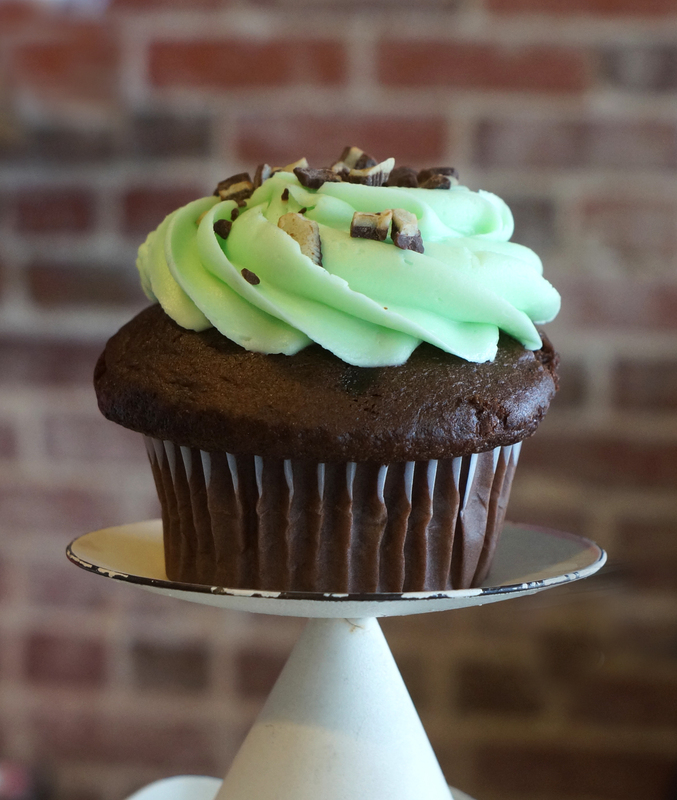 Decadent chocolate cake topped with a green peppermint buttercream frosting. 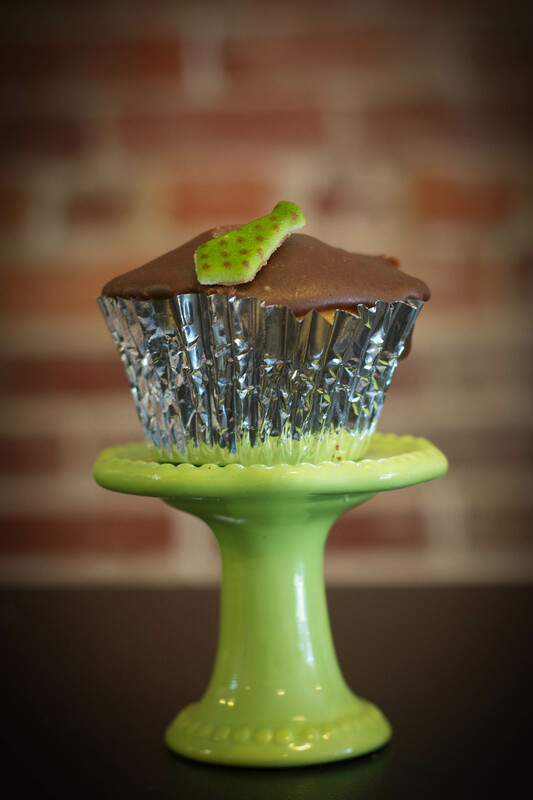 Chocolate mint candy crumbles glitter the top for some added minty freshness and rich chocolate goodness. 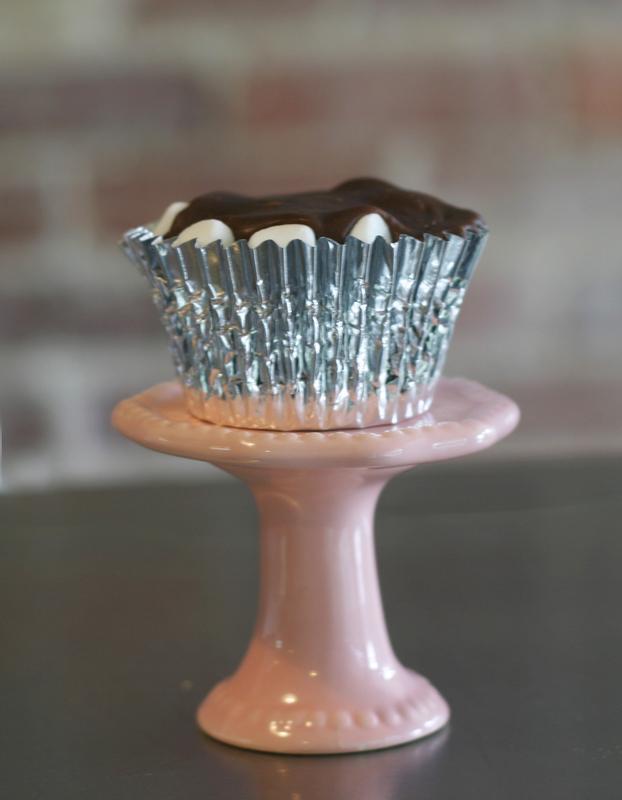 Chocolate cake with marshmallows on top and fudge frosting poured over all of it. Best thing this side of the mighty Mississippi! 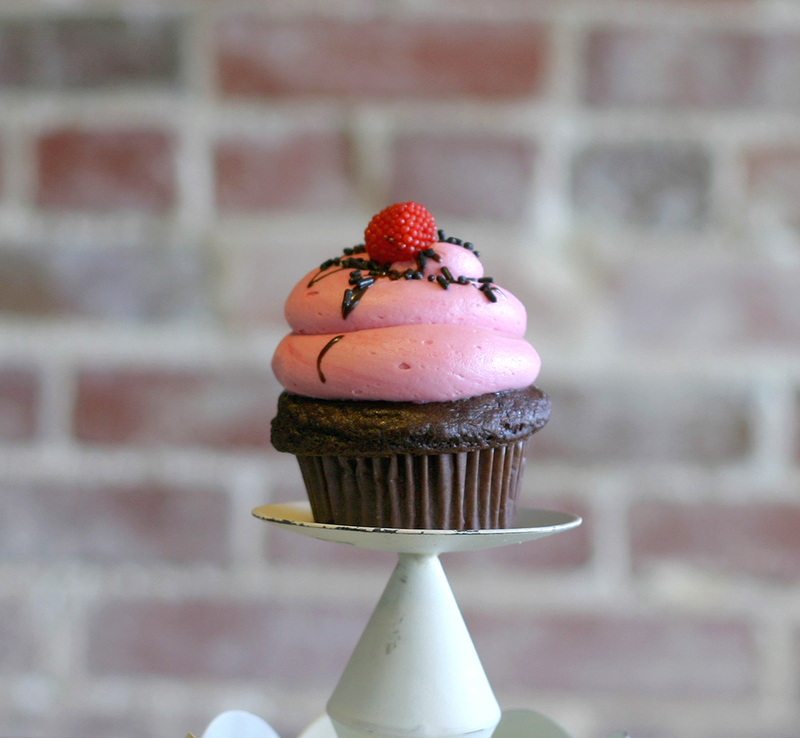 Delectable strawberry cake topped with vanilla, chocolate & strawberry buttercream. Like the ice cream, but better. 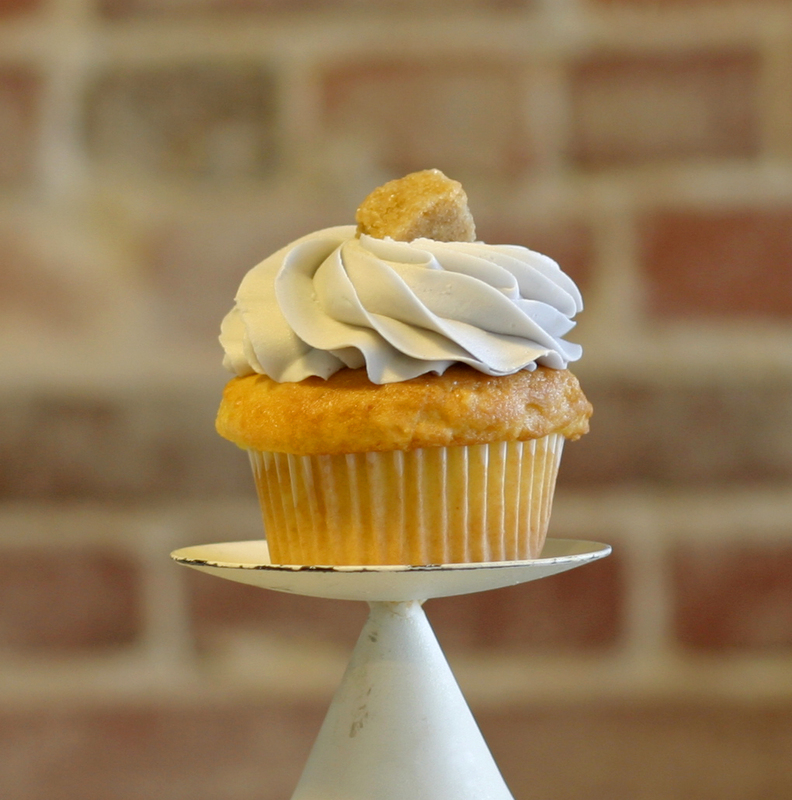 Delicate butter cake topped with our homemade caramel buttercream. It may be old fashioned, but this flavor is timeless. 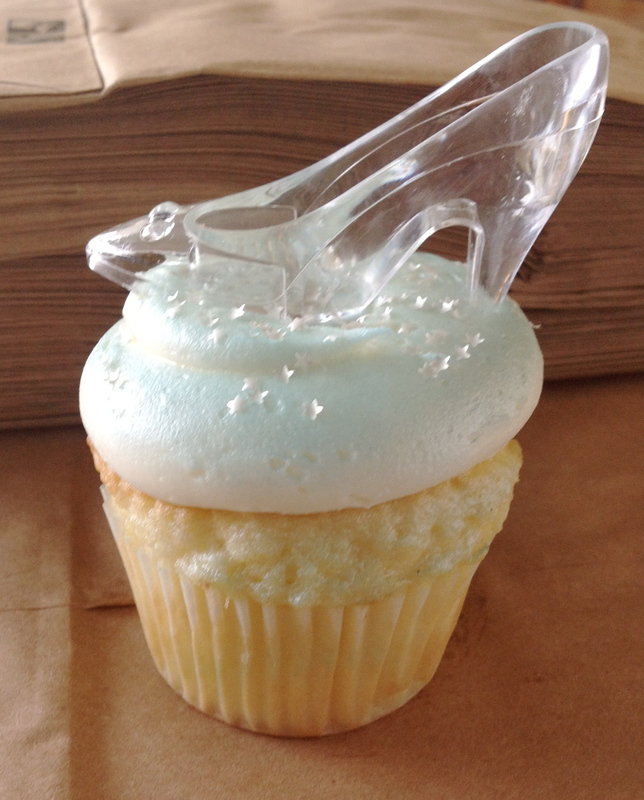 Delicate white velvet cake topped with a “knock yo socks off” vanilla bean buttercream and white chocolate curls. It’s popular for a reason. It’s okay to jump off this bridge just because everyone else is. 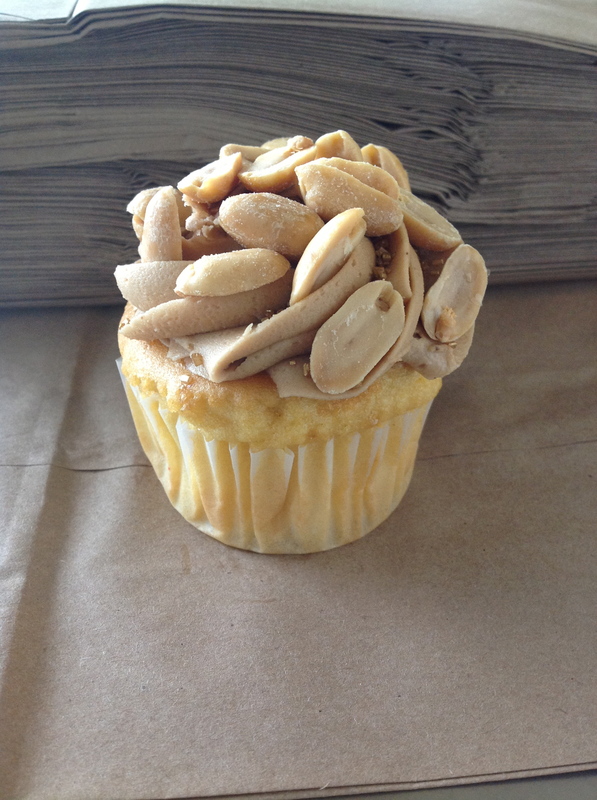 Butter cake topped with caramel buttercream, covered in salty whole peanuts and a caramel drizzle. Who doesn’t like a payday? Peanut butter cake topped with cream cheese buttercream. 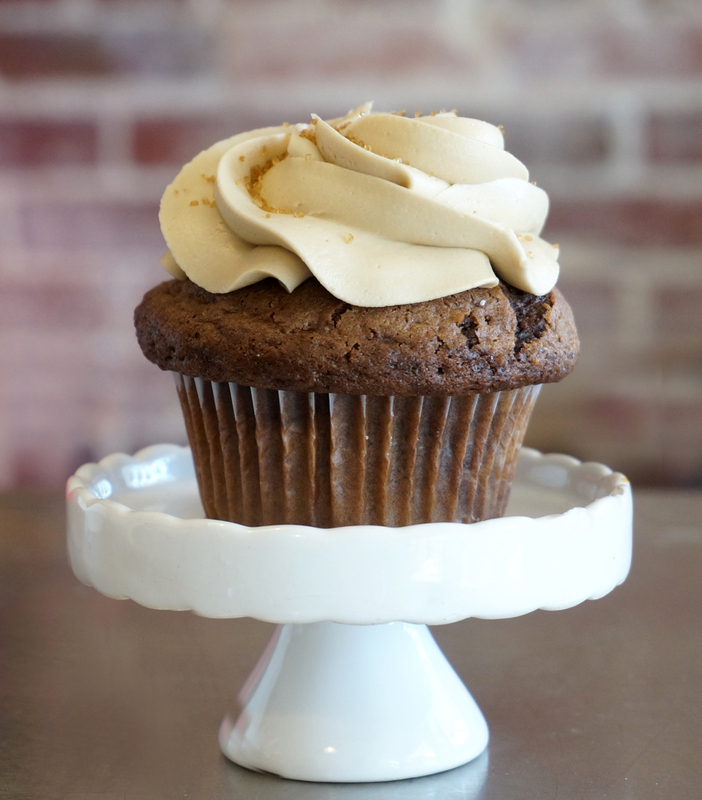 This cupcake contains both peanut butter and cream cheese, so it will be difficult to contain yourself. 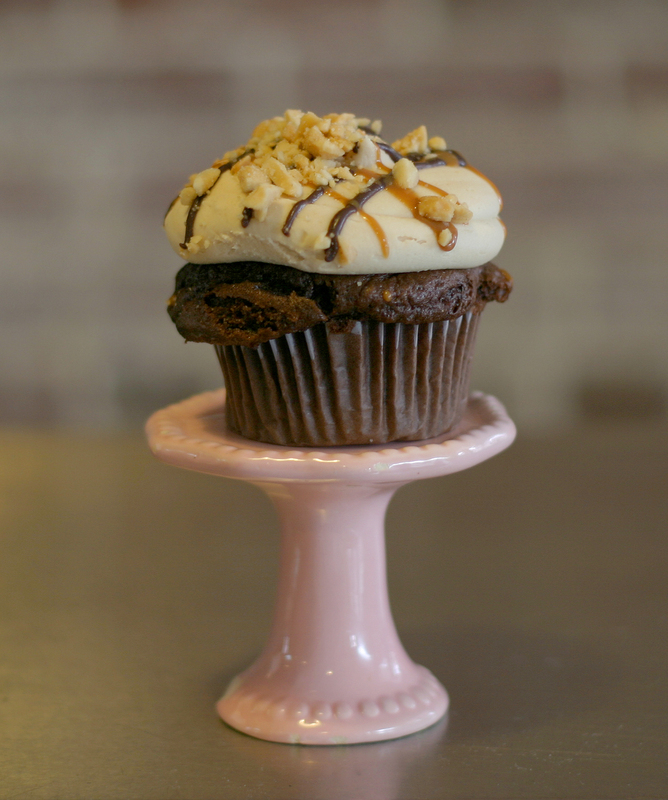 Devil’s food cake topped with creamy peanut butter buttercream, a chocolate drizzle & a peanut butter cup candy. Scientifically regarded as proof of a higher power. 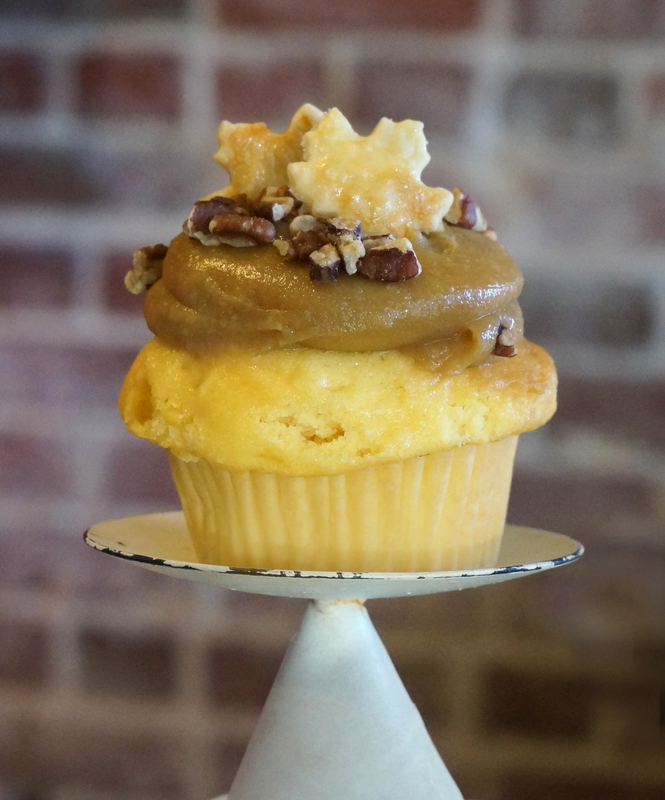 Our delectable butter cake topped with a pecan pie filling topping, a pie crust leaf, and loads of toasted pecans. 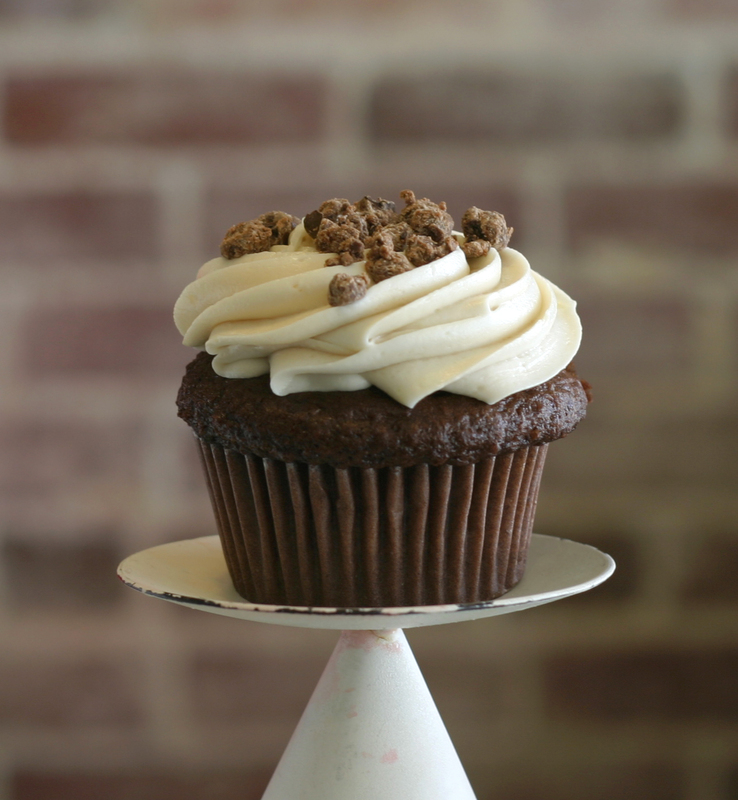 The perfect amount of sweetness reminiscent of Grandma’s specialty – never disappoints. 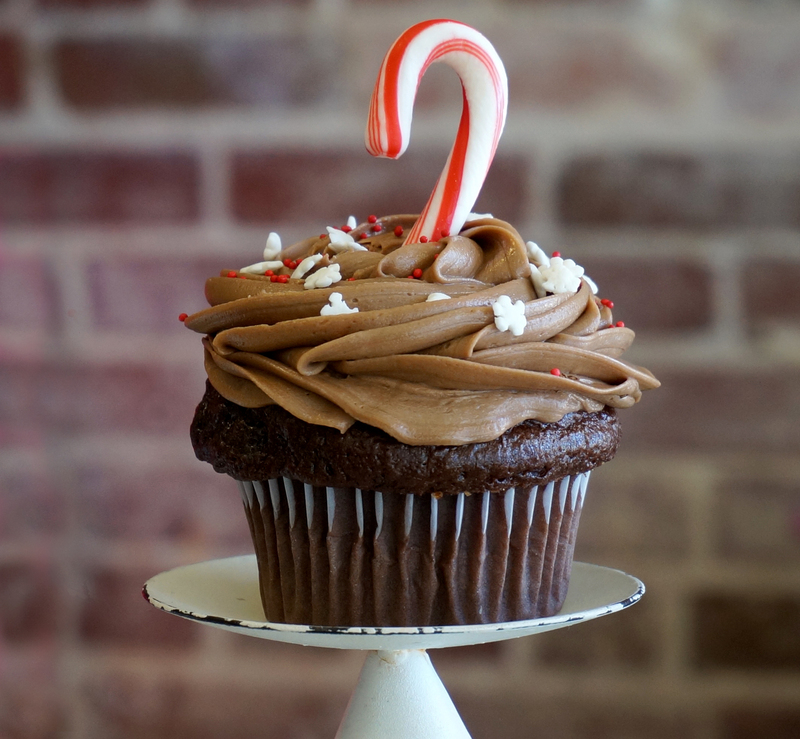 Our delish, devil’s food cake topped with a peppermint-chocolate-coffee buttercream, snowflakes, and a soft peppermint candy. Coffee shops got nothing on us… except maybe the caffeine aspect. 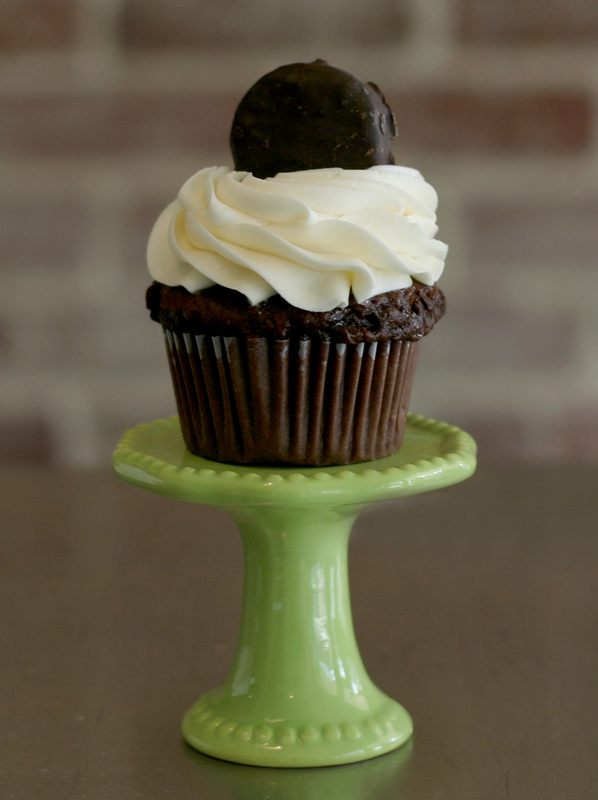 Our yummy chocolate cake topped with a white peppermint buttercream and a peppermint patty candy. This thing is FRESH. Sweet pineapple cake with a coconut cream frosting. It’s the libation you eat! Tender white velvet cake with a vanilla buttercream frosting. Simple and sweet. Plain Jane also gets holiday attire every once in awhile. 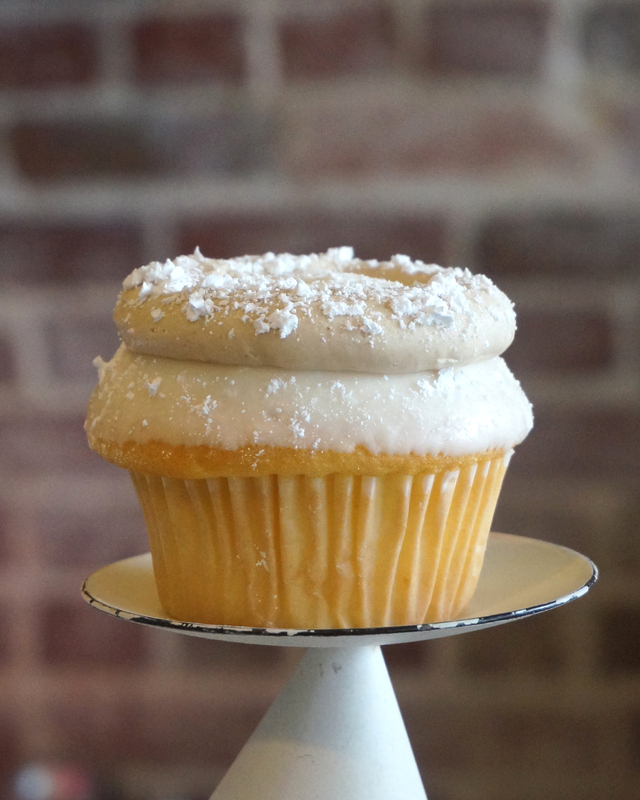 Butter cake with our special powdered donut buttercream and a powdered sugar dusting. Good morning! 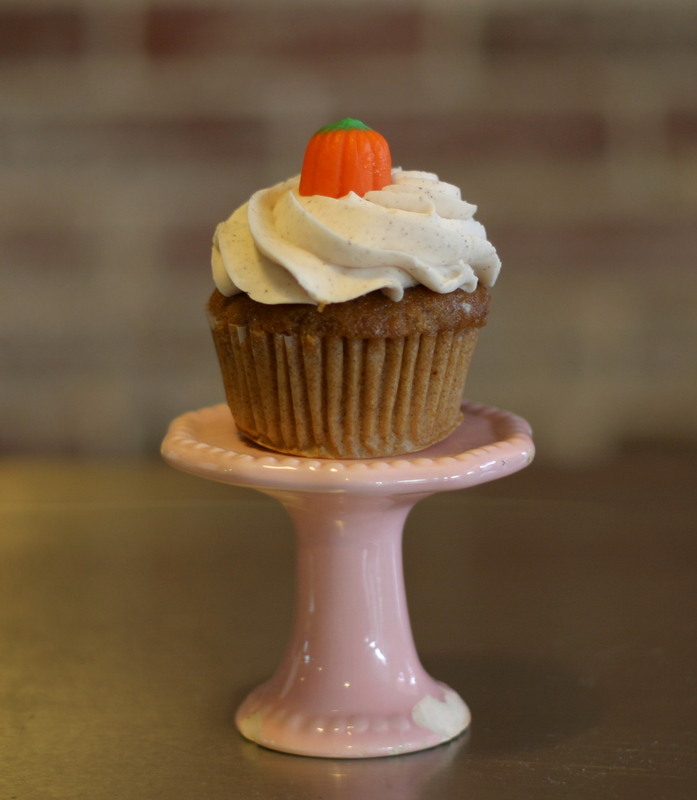 In the Fall we basically want pumpkin flavored EVERYTHING. This is actual cheesecake. With pumpkin. Oh yes. Moist white cake with a cream cheese raspberry swirled buttercream, topped with white chocolate curls and a raspberry candy. 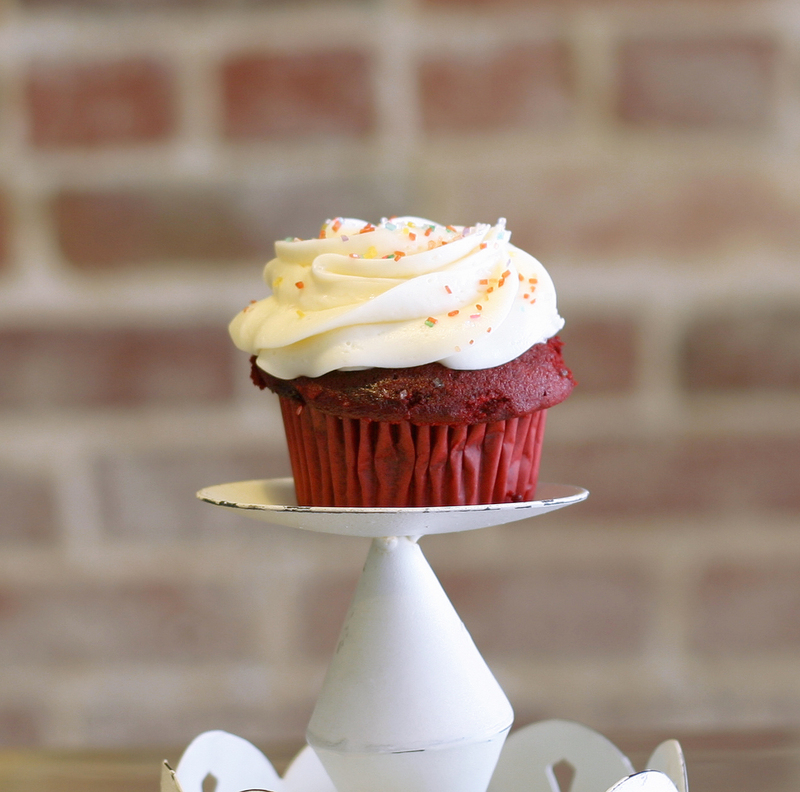 Moist red velvet cake with creamcheese buttercream icing that will literally set you free. 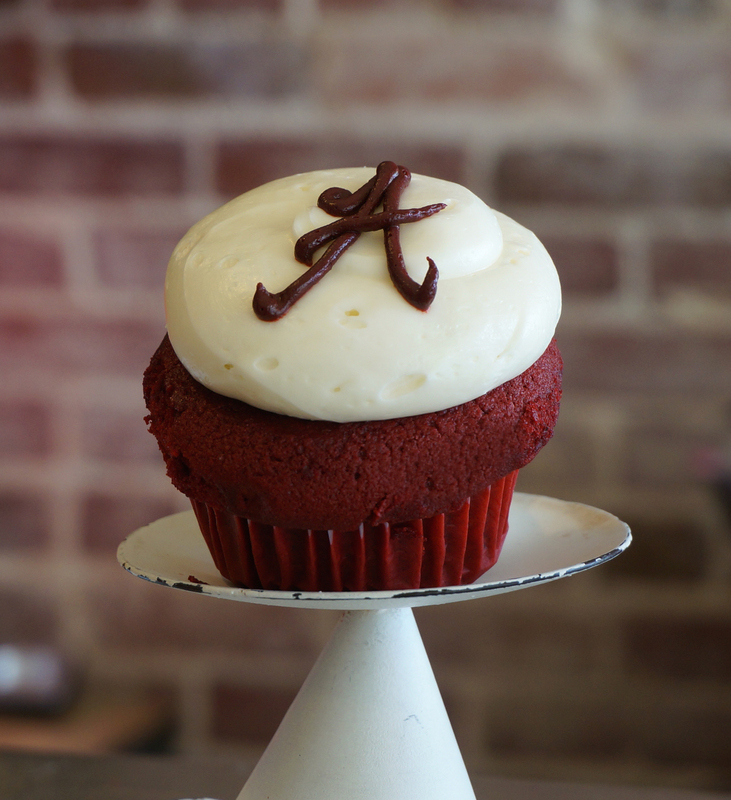 Our perfectly moist “crimson” velvet cake, topped with cream cheese frosting, red sprinkles and an Alabama, “A”. We feel like Bear would be proud. 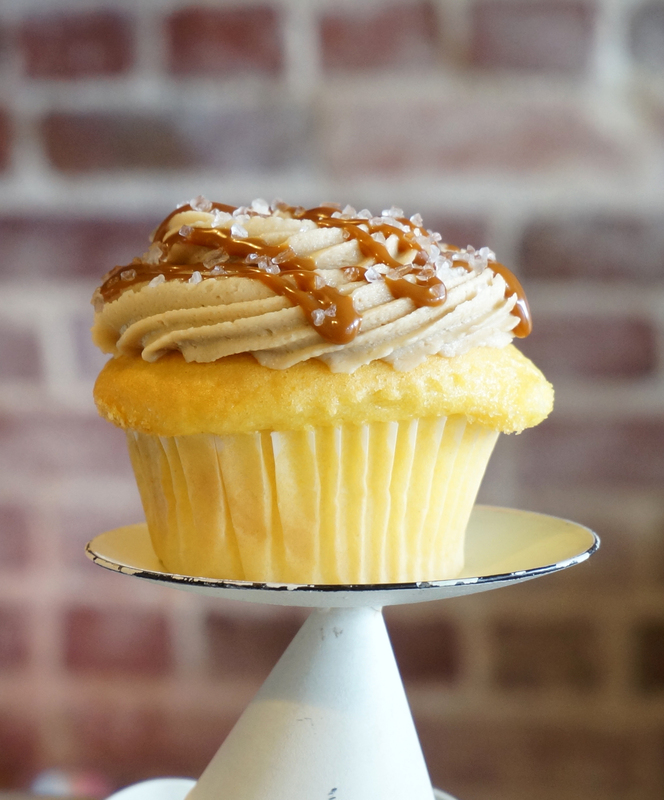 Yellow buttercake, caramel buttercream, caramel drizzle, sprinkled with sea salt. That salty sweet you seek. It’s here. 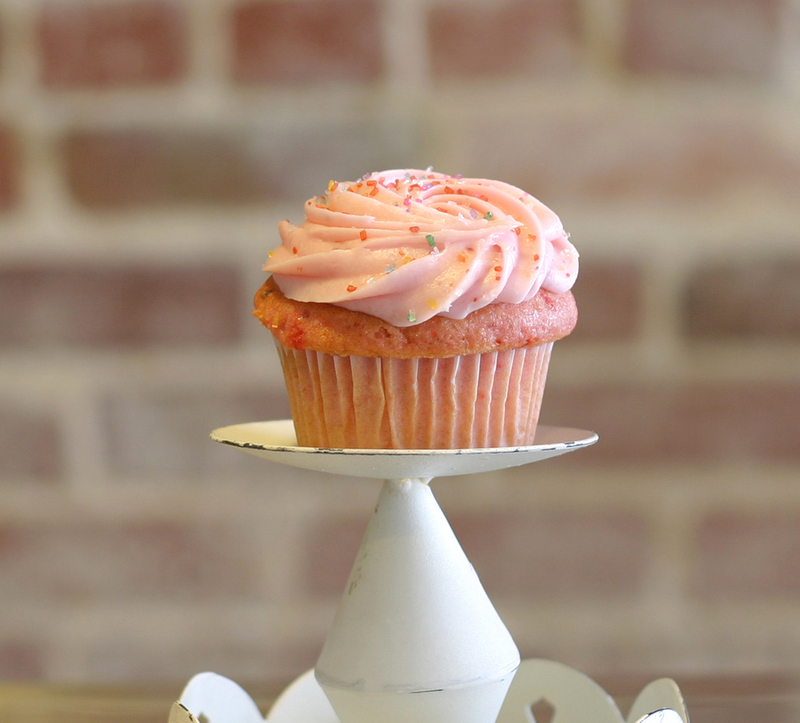 Delectable strawberry cake with a strawberry buttercream frosting. Simply strawberry, elaborately delicious. 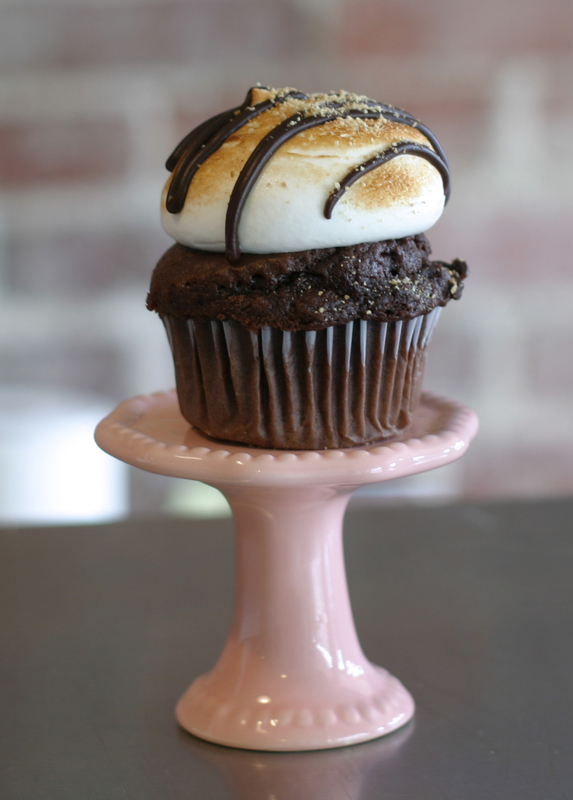 We combine chocolate cake, graham cracker crumbs, a toasted marshmallow meringue and chocolate ganache. Then…you scarf. YOU’RE KILLIN’ ME, SMALLS! Chocolate cake, topped with caramel buttercream, chocolate drizzle and chopped salted peanuts. 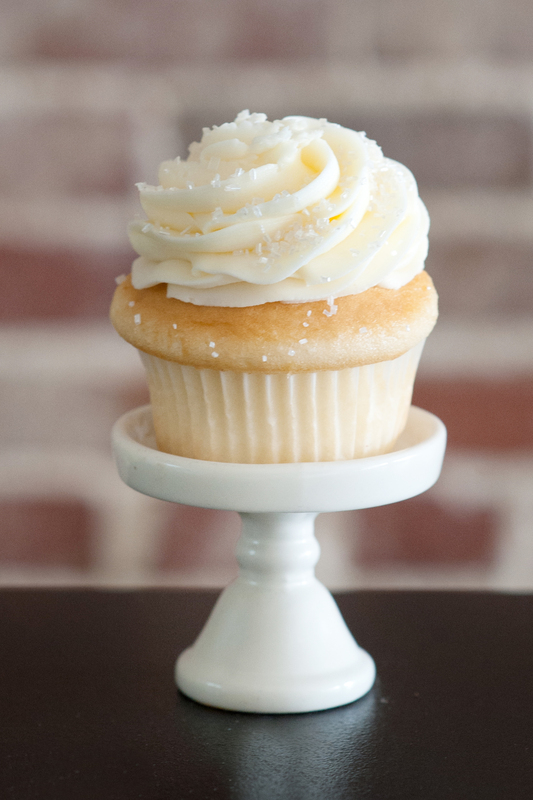 Tender white velvet cake, smooth coconut buttercream frosting, topped with a pinch of fluffy, sweet coconut and sparkles. 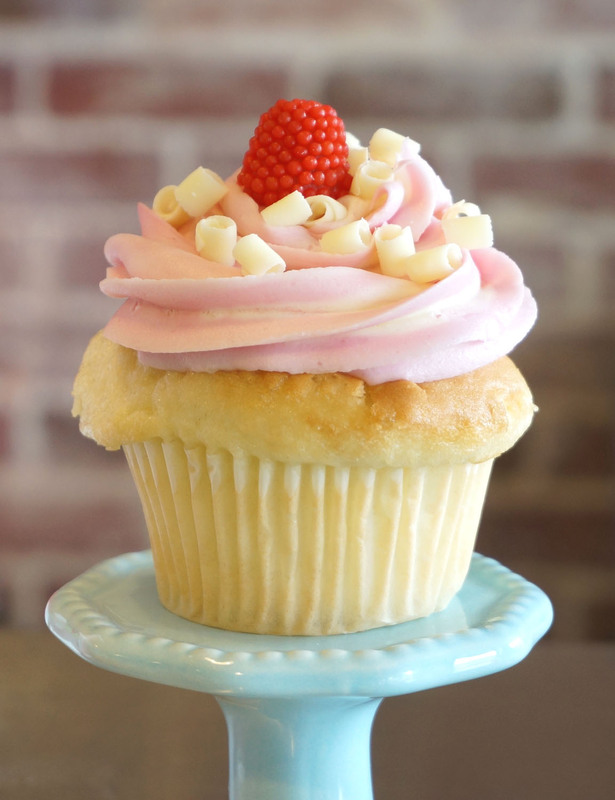 Delectable strawberry cake with a cream cheese buttercream filling, strawberry buttercream and topped with a berry candy. Strawberries and cream cheese. We needn’t say more. 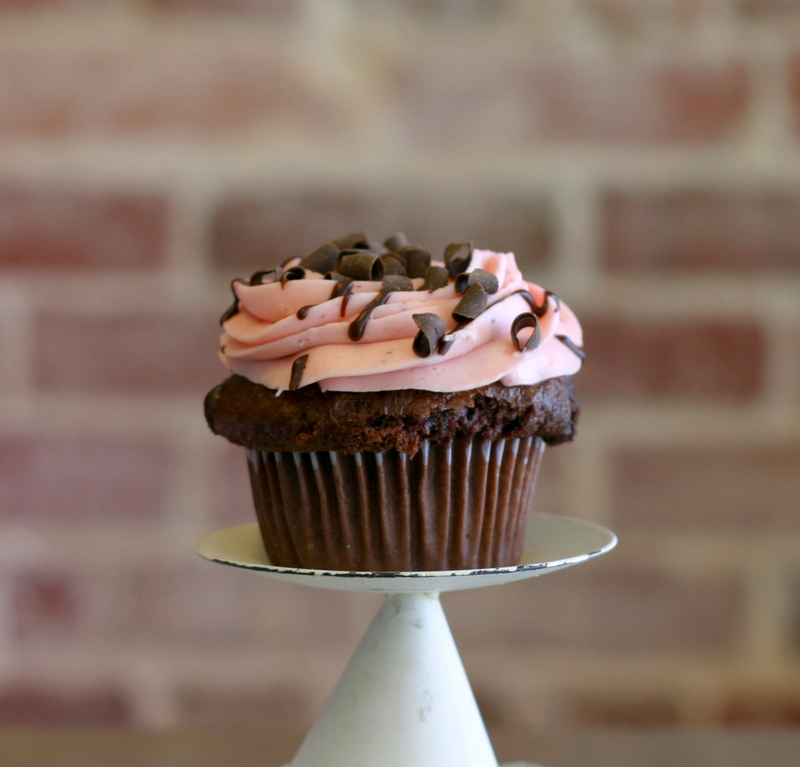 Chocolate cake topped with strawberry buttercream, chocolate ganache drizzle and milk chocolate curls. 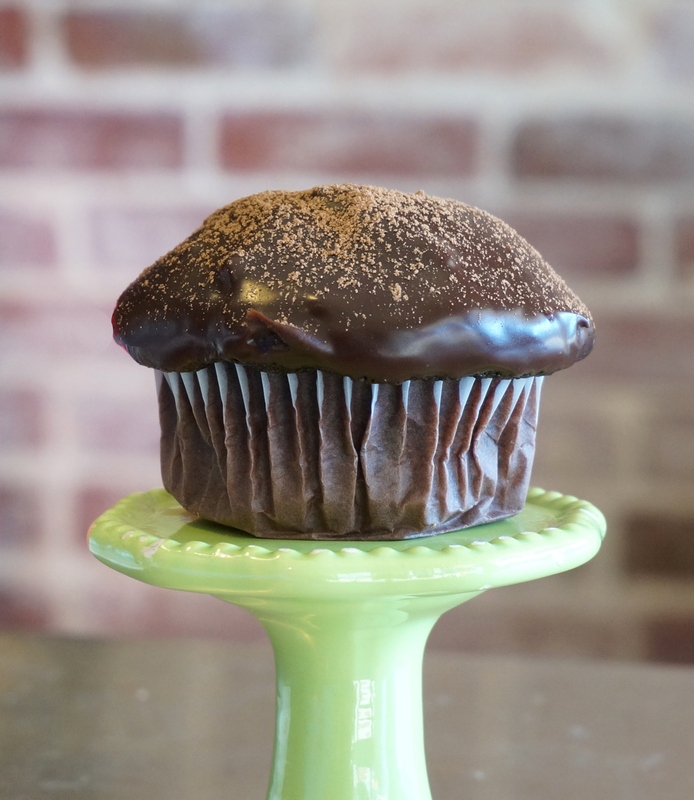 If this cupcake has a kissing booth at the fair, it would make a million dollars. 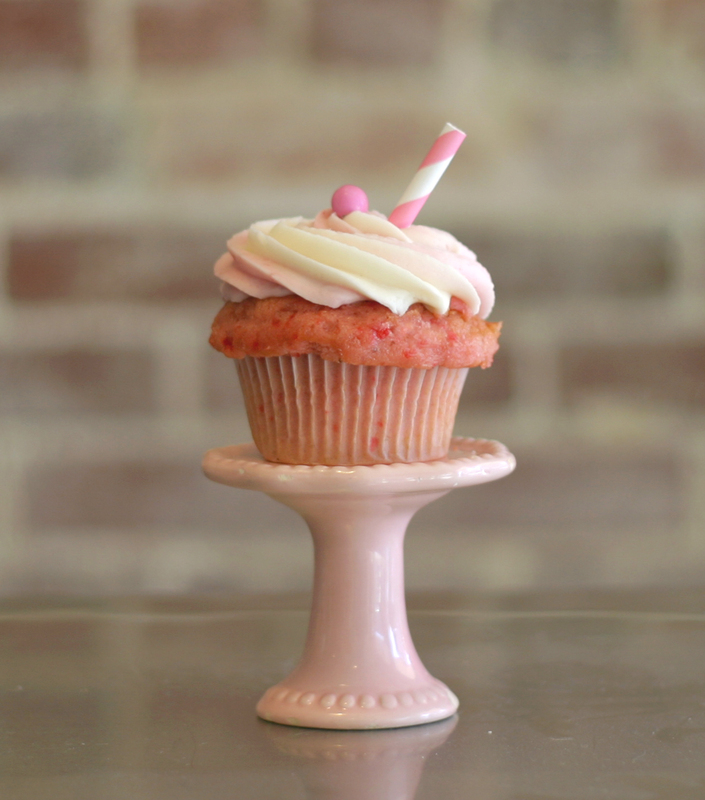 Velvety white cake with a strawberry-cream cheese swirl icing, topped with a candy and a straw. If you want to eat a delicious milkshake, this is the way to do it. Might be the only way! Melt-in-your-mouth sour cream butter cake dipped in a delectable almond buttercream glaze. Cookie in cake form. 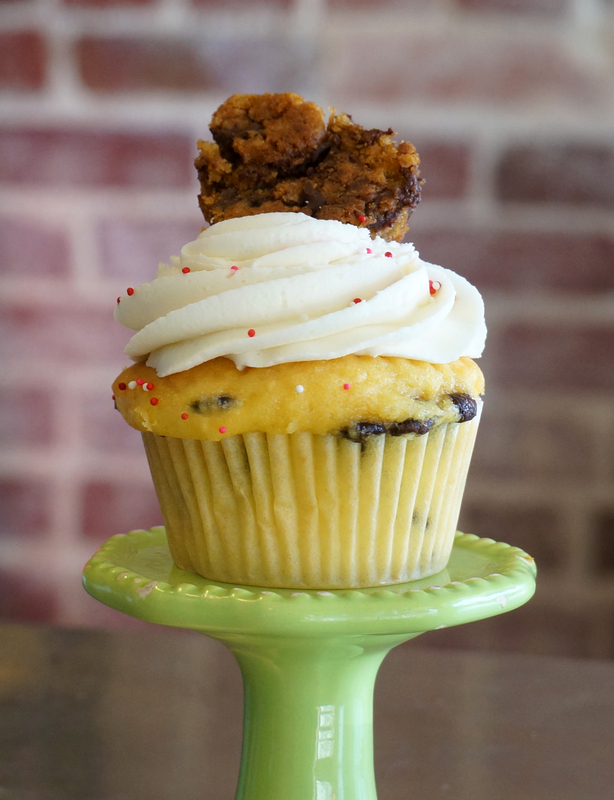 Buttery chocolate chip cake topped off with vanilla buttercream, a chocolate chip cookie & sprinkles. It’s two treats in one! 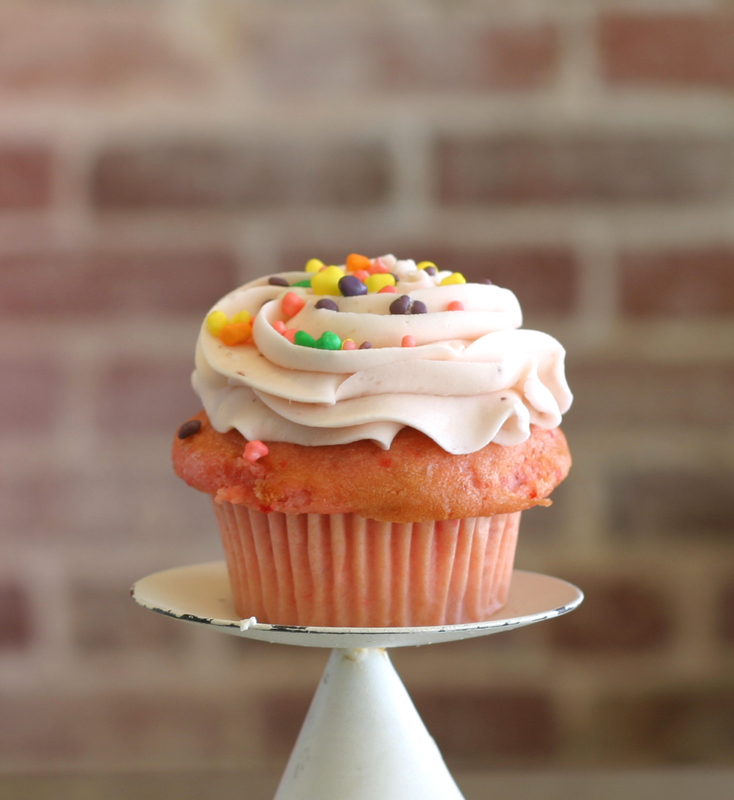 Strawberry cake topped with a strawberry buttercream and dipped in Nerd candies. 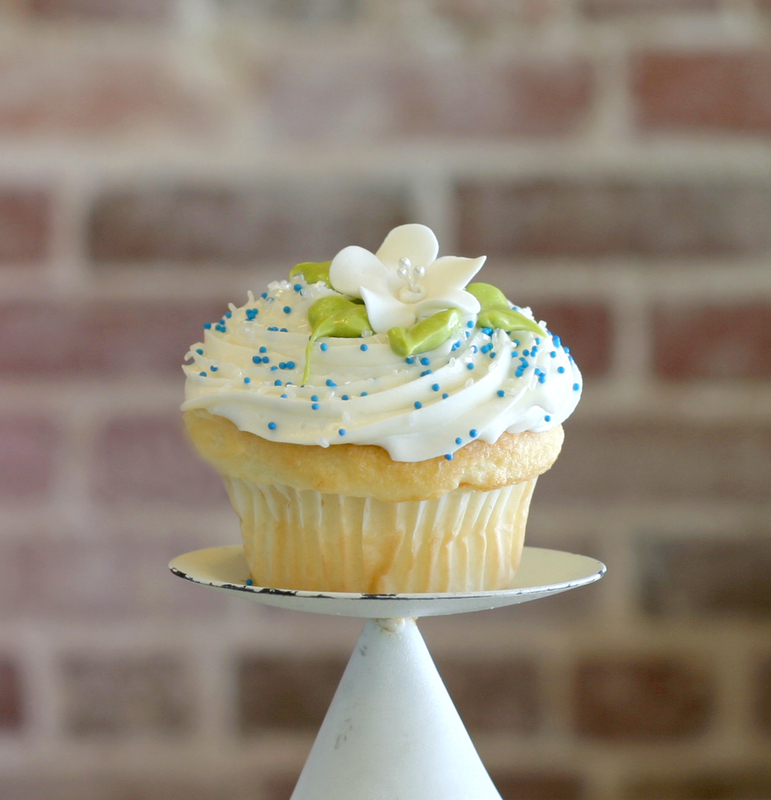 Our white velvet cake topped with a sweet, jasmine buttercream and a white flower. You’ll want to float the river with this one. 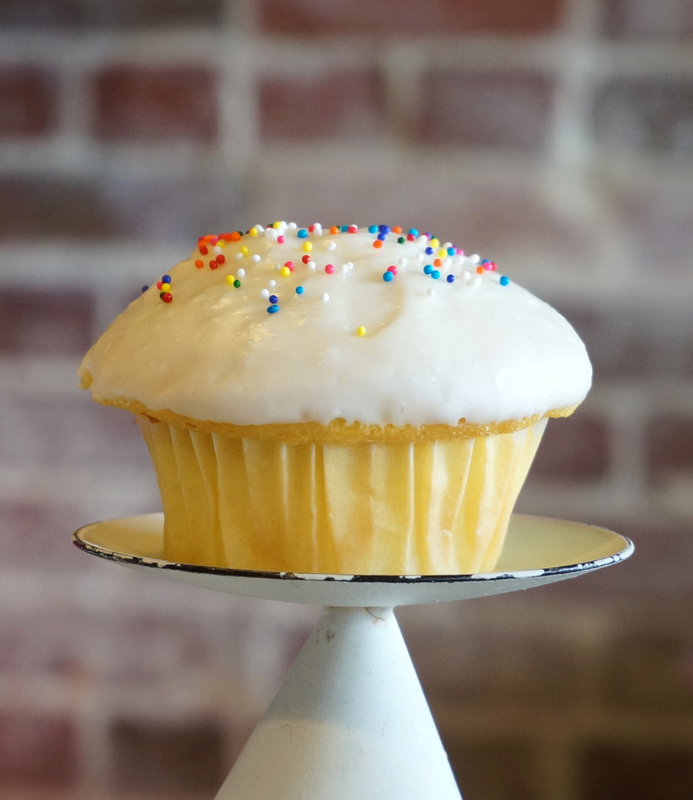 Our famous lemon cake topped with an Earl Grey buttercream. God save the Queen! 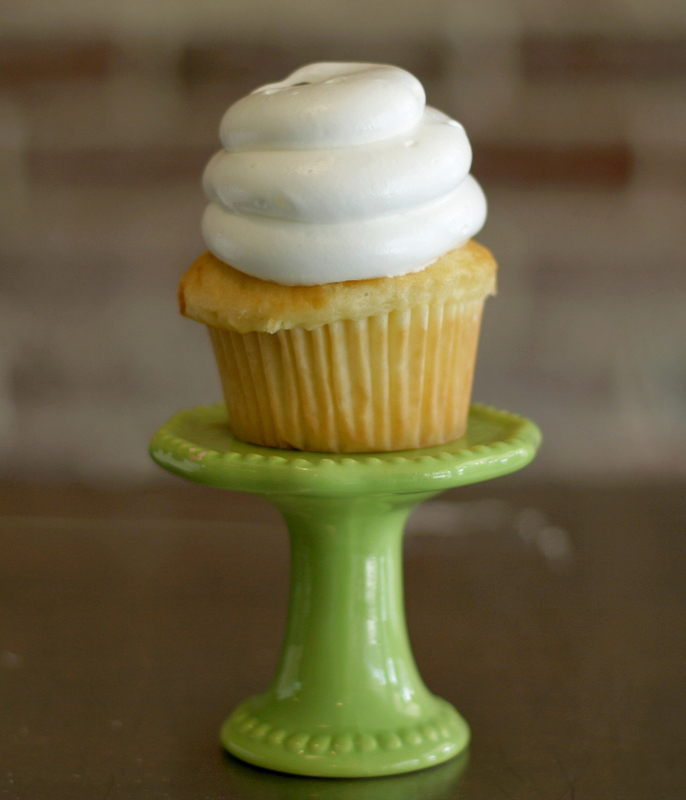 Our famous white velvet cake topped with an Italian meringue buttercream. 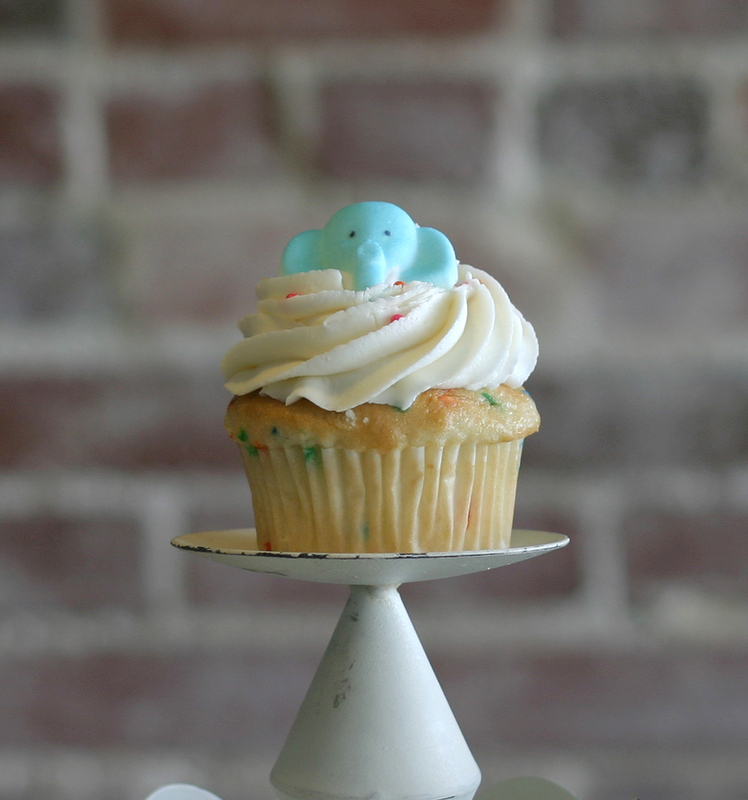 The story of this cupcake is…neverending. 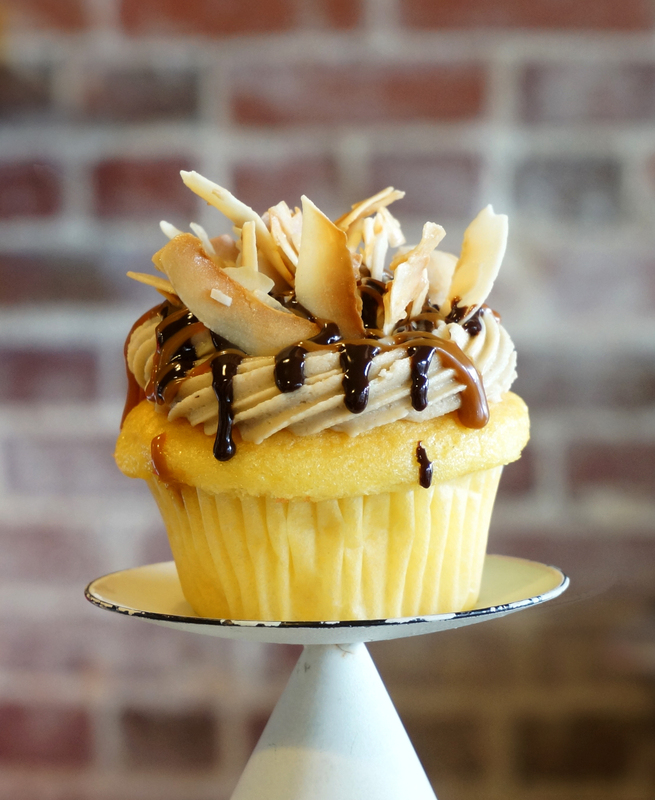 Yellow buttercake, caramel buttercream, chocolate and caramel drizzles and toasted coconut chips. La manuia le tausamiga! 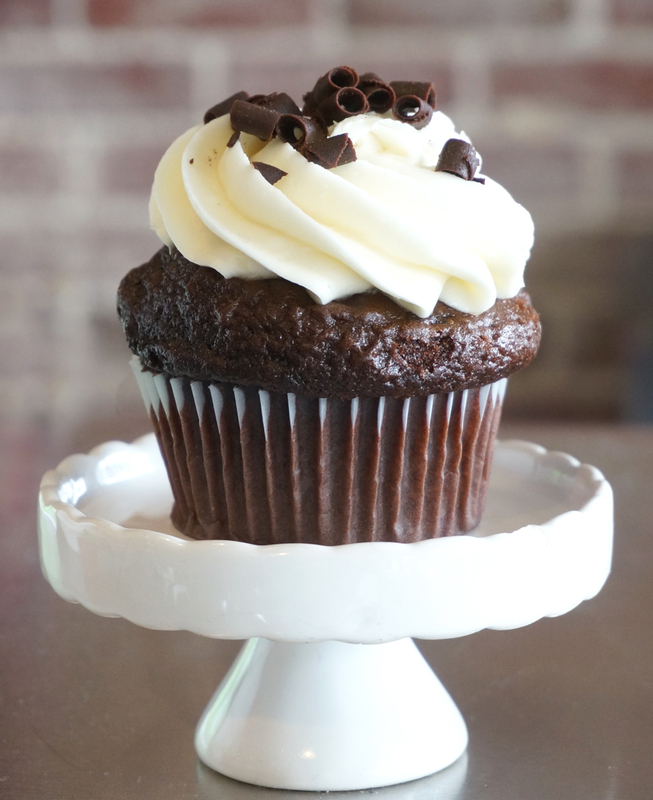 You want rich chocolate cake with smooth chocolate buttercream frosting? Done. Silky caramel & chocolate drizzle on top of that? Boom. 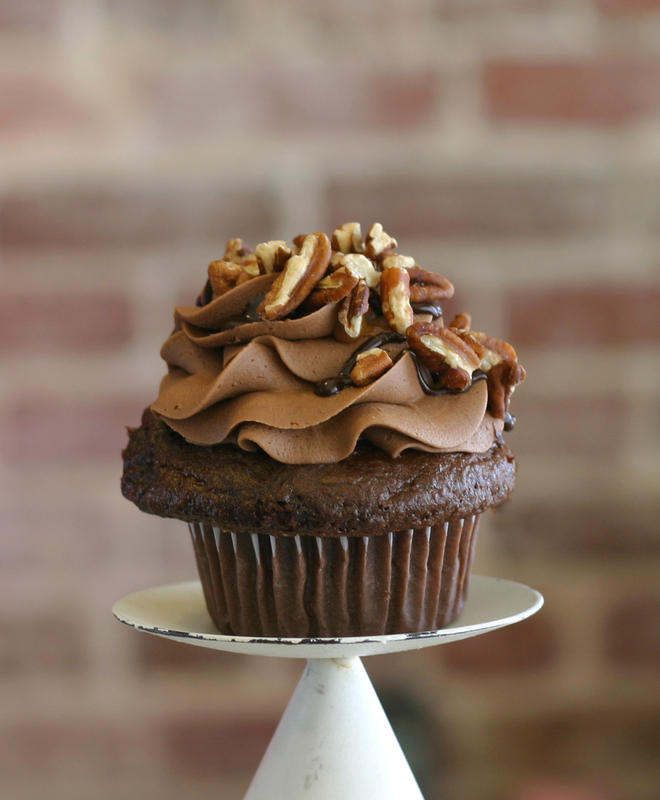 Toasted pecans atop that? Treat yo self. 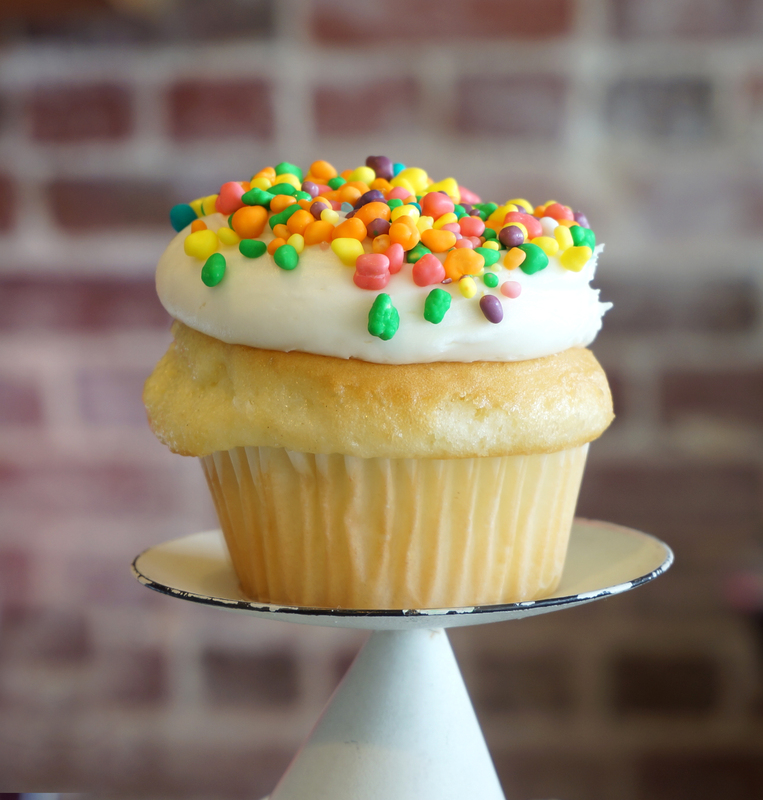 Our white velvet cake loaded with colorful sprinkles and topped with vanilla buttercream, sparkling sugar and a fun circus animals. Under the Big Top transforms under holiday demands. 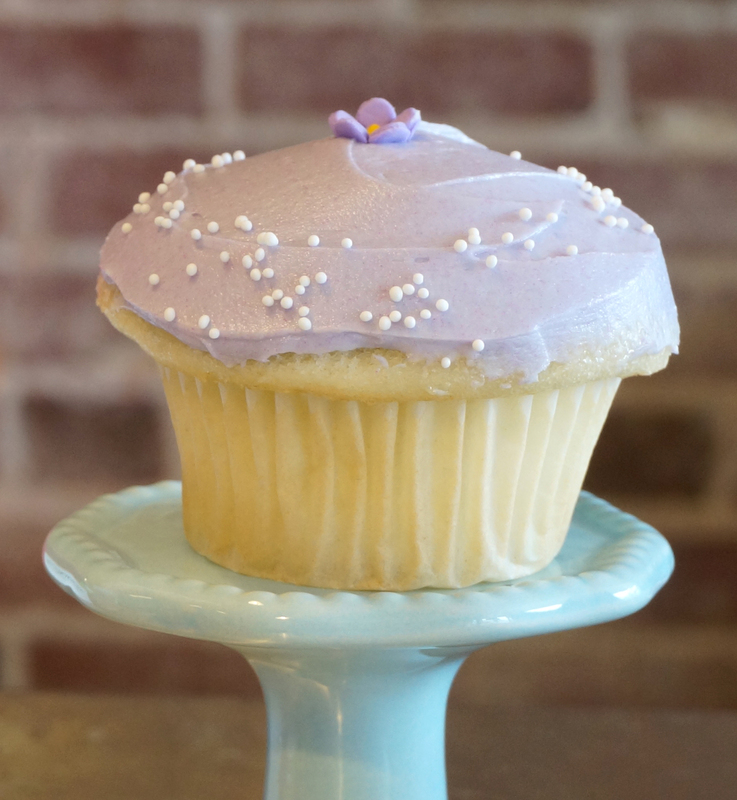 White cake with violet flavored frosting. Simple and unique. And good! White velvet cake topped with almond buttercream. It’s our #1 best seller, because the truth is, there’s not a wedding every single day. White cake with white buttercream topped with nerds. It’s weird. Yet, you can’t help but like it. 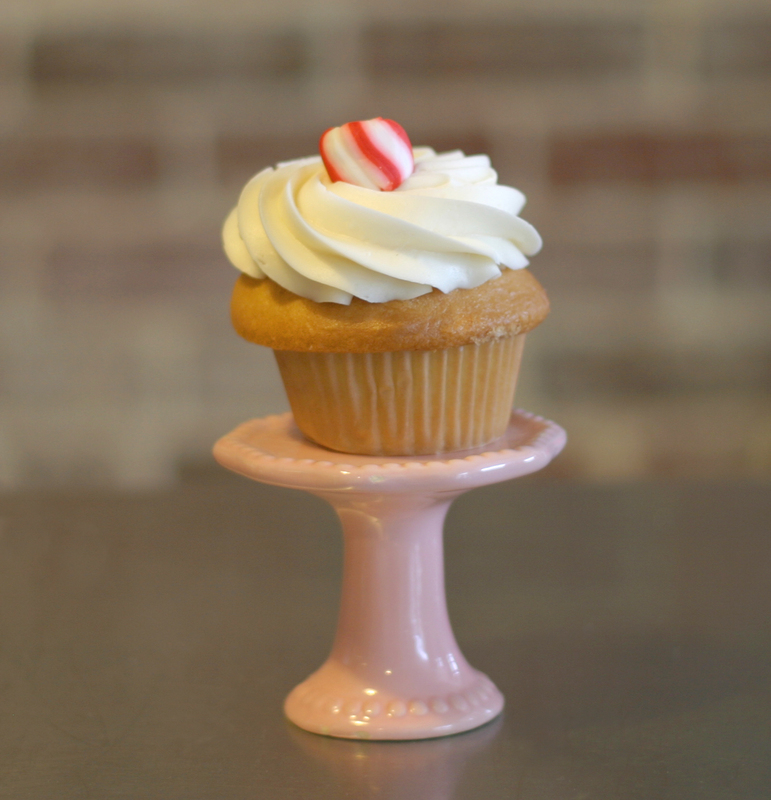 Our tender white velvet cake topped with a peppermint cream cheese buttercream and peppermint bark. As smooth as Mr. Crosby’s crooning. 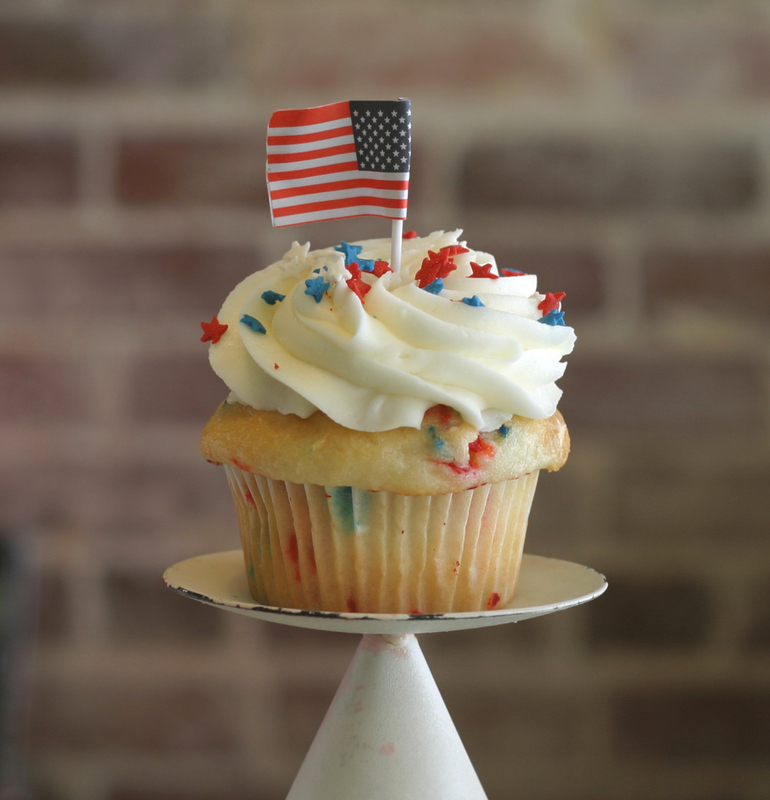 A red, white and blue confetti cake topped with a vanilla buttercream and all dressed up for Independence Day. Lemon poppyseed cake with a lemon glaze and white non-parels. Your taste buds won’t be in Kansas anymore. 2 business days advance notice required for orders. 3 weeks maximum lead time for orders. Order payments are transferable ONLY if notice is given at least 2 business days in advance. A delicious bundt cake, generously glazed with our amazing buttercream icing!